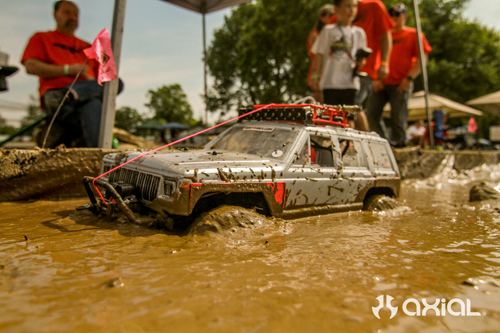 First, just because we’ve posted something about AXIALFEST, it doesn’t mean the floodgates have opened. DO NOT CALL CISCO GROVE CAMPGROUND PLEASE!!! This is purely an announcement that registration for AXIALFEST 2018 will open March 1st. 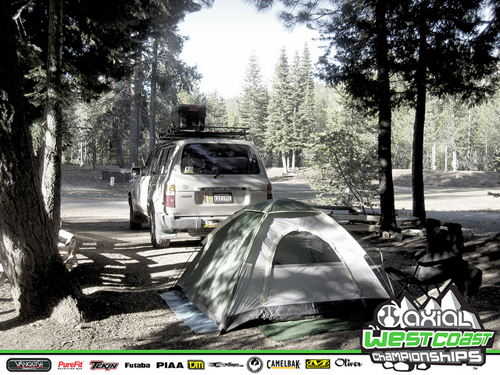 We will let you know when Cisco Grove Campground is ready to take camp spot reservations for AXIALFEST2018. 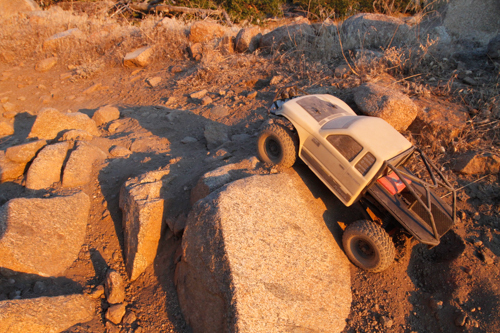 check out this upcoming Axial Chevy C10 option body on a Axial SCX10 chassis with custom painted Boom Racing 1.55 Yota Classic Beadlock wheels rolling on Pit Bull 1.55 Growler AT/Extra tires with Alien Kompound. 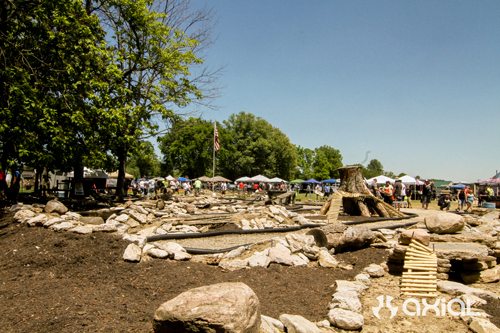 How did this sleepy country neighborhood event become the second largest scale trail event in the US of A and the largest TTC event? 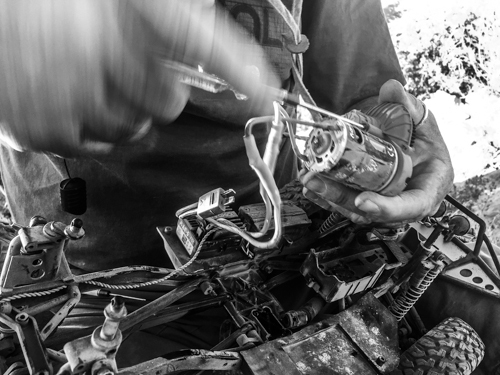 To have met Mike Kirby of Team KNK Hardware, it’s easy to understand. He is pure enthusiasm with a whole lot of spice add-on’s like; big hearted, compassionate and driven! 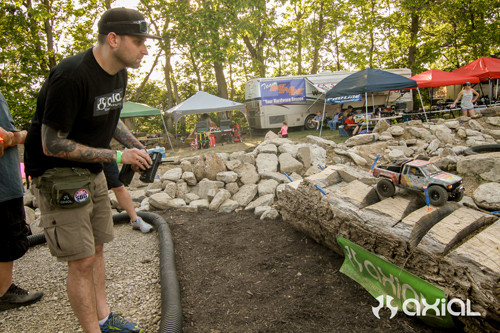 And he is doing it all for the right reasons, to bring awareness and grow his segment of choice in the hobby industry. He knows that in order for his company to succeed, he needs the upper end of the food chain to succeed and he is going to great length’s in order to do so. On top of it all, he is going about it the long hard way; do events, promote the activity, hope people come, have fun, tell friends, purchase vehicles, get more involved, want to build, need screws to build with, thus purchase KNK Hardware. That is serious long term investment and commitment. 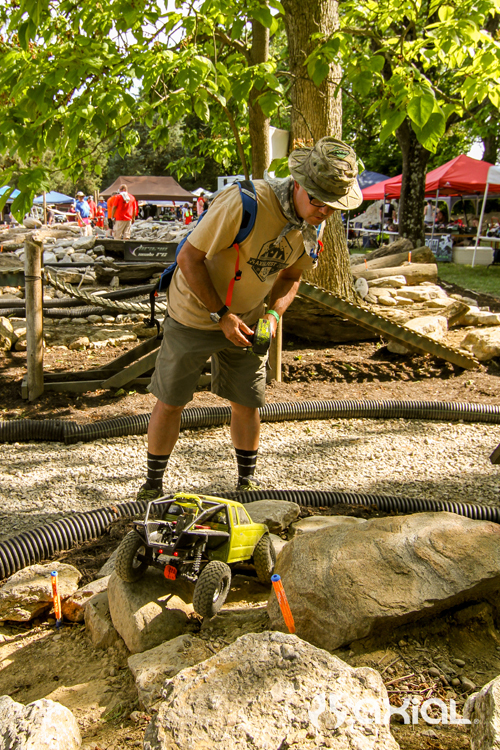 For Kirby, it’s just hard work for something he believes in building on his 35+ years of being an R/C enthusiast! 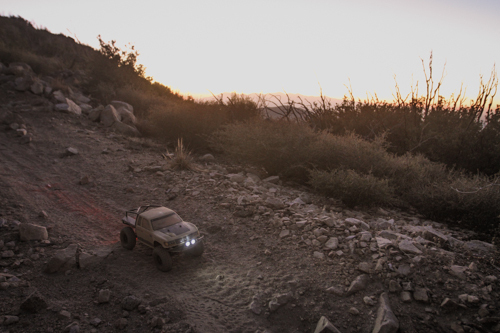 Luckily for Axial we fall into his radar, with our attention on the scale trail segment, we gain a partnership in KNK Hardware with their events aligning with our like-minded mission. 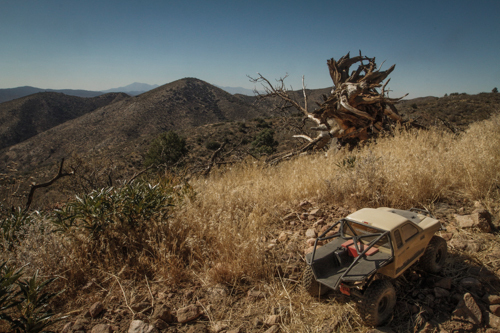 We share the mission to bring awareness to the scale trail segment. While we all love our fun trail runs, events are simply the best way to effect change and awareness on a more grand scale. Events brings the potential added bonus of more exposure. 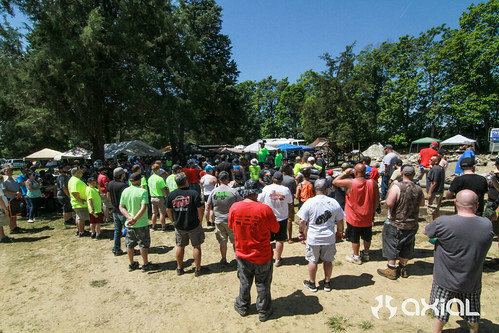 Events potentially bring a larger group of people together and result into “communities” that share a common bond that naturally wants to grow and share the fun. 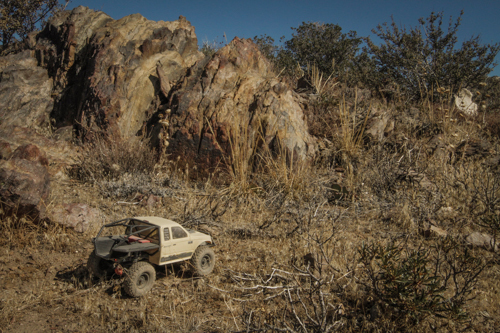 Scale trail runs by nature are very organic, held outside of the common driver stand / designated purpose built courses. 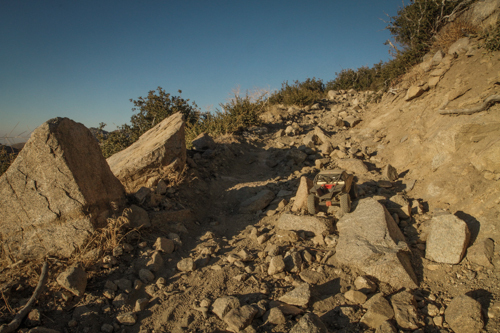 But Mike wanted to bring a bit of that back into the scale trail segment because, while the grandiose trails of AXIALFEST are just that, they are not permanent, not easily accessible, only held once a year and 3,000 miles away from Kirby’s backyard! 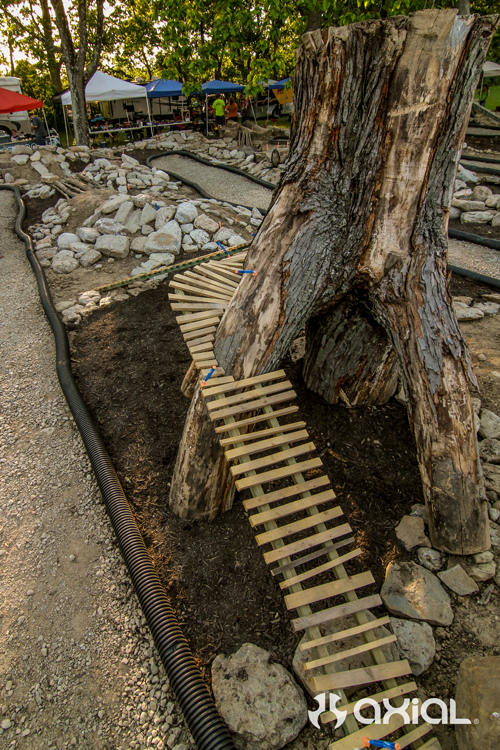 Mike has his own ideas and wanted to transform his backyard into the ultimate playground for scale trail enthusiast in his area. Kirby’s vision was a bit more than most, he wanted something more permanent, something he could keep building upon. At the same time, his playground is something of a testing ground as he knows very well from his racing days, it’s all about steering wheel time VS just purchasing the latest greatest perceived performance advantage. 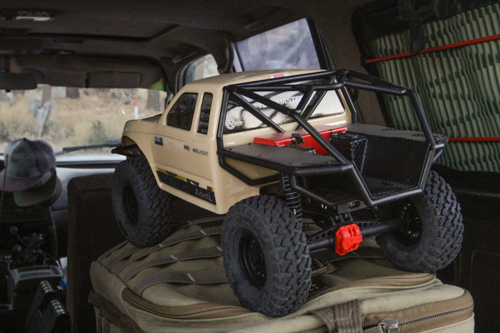 In June 7-10 of 2015, just after two in business, Mike and Amberly Kirby held their first event on their 14-acre property, to include camping space and their idea of what they wanted to see in a scale trail Tough Truck Challenge facility. 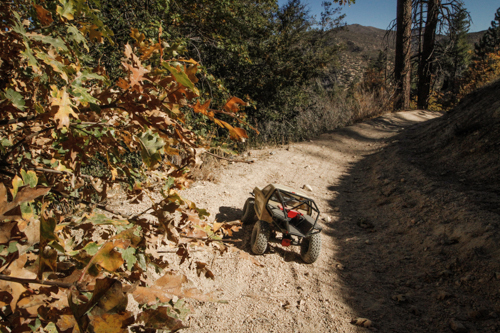 What sets Kirby’s course apart from the rest is his layout of the trails with separate or detached groomed walking area’s that are wheel chair accessible, kid and family friendly. 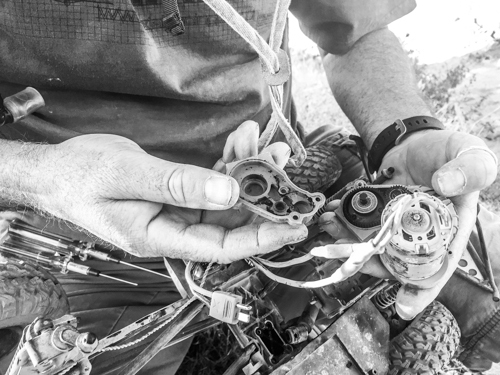 With all this attention to detail for the enthusiast, Mike knows the number one issue with competition based scale trail events is looking after the trail itself. But add a foot print or bumped rock by a 100+ pound individual and a trail could be blown! The scale gods would frown as no proof has been made to big foots actual existence (debatable, but for all intended purposes). If such happened in the middle of a competition, it would change everything and it has happened. 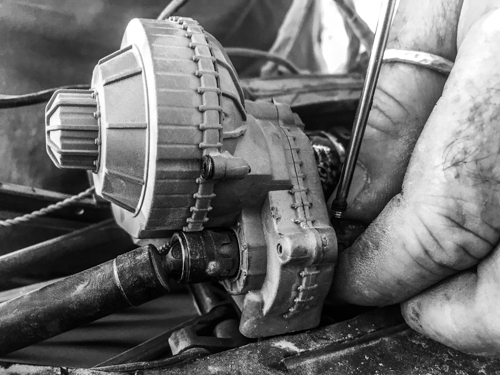 Kirby saw the separation of driver and rig simply as the only solution to provide the best competitive platform possible, thus the KNK Farm with its unique features was constructed and continues development. Like when his son, Gavin age 7, says “Dad, let’s make this bridge that walks up and around and back down the tree!” Kirby obliges, keeping the whole family involved. 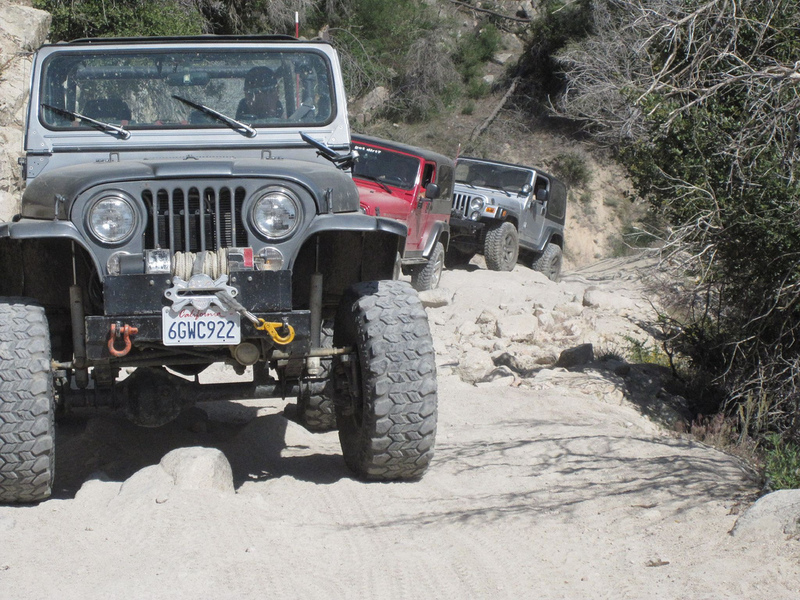 While the competitive spirit runs very strong within Mike’s DNA, Kirby also knows the offroad enthusiast is very community driven and that aligns well with Mike’s super family friendly environment. We are in his backyard, we are his guest, so it’s his rules, his family’s playground we’ve been invited over to play on his playground. 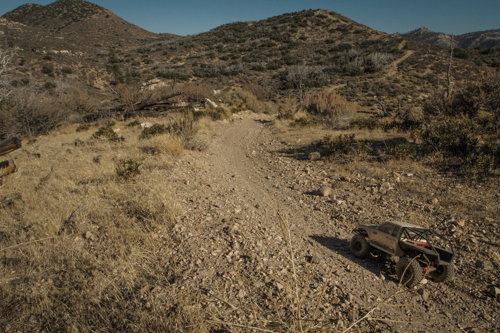 It’s not a race track, it’s not a park, it’s Mike and Amberly Kirby’s personal backyard. Come as guest, leave as friends, but help clean up after ourselves so we can continue the greatest family gatherings east of the Mississippi! All the planning is sorted, now we are about to do this thing! We wake up early, I think my alarm went off at 6:00am. Didn’t sleep that well, I think I was too excited. Too much planning made for too much anticipation. 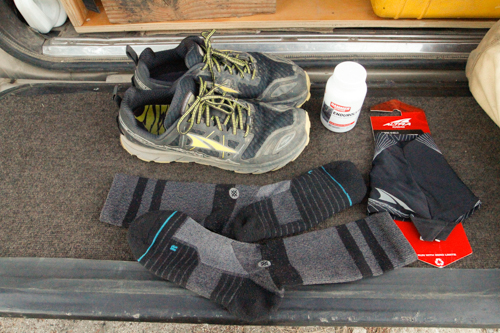 It’s Wednesday Morning, October 25th, and I get myself physically prepared; Altra Lone Peak 3.0 Trail shoes, Stance Training Crew socks and Hammer Nutrition Endurolytes for cramp prevention as its going to be a warm day. 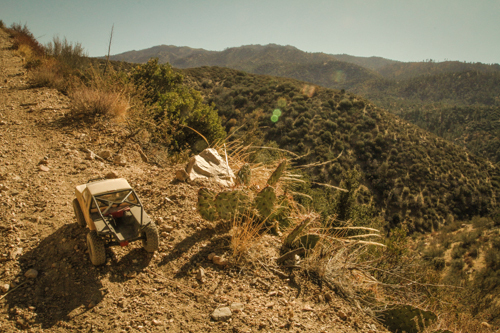 I load the beloved SCX10 Trail Honcho into my ADV80 and we get ready to depart camp and make our way down to the the start of the trail just past Crab Flats Campground. 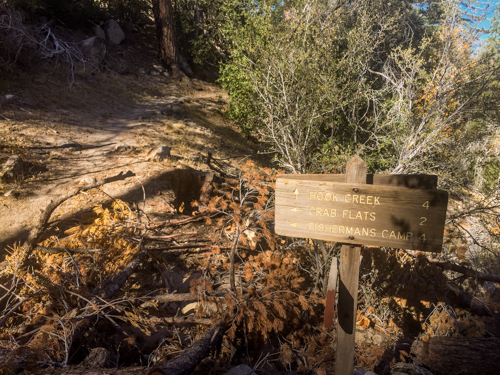 We will start here (Google Map Link) at the Redonda Ridge 1W17 trail marker sign. 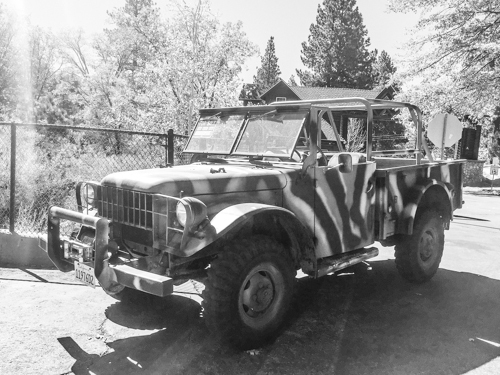 Four of us will be walking the trail and John Schultz and ScottG will be taking the two vehicles back to camp awaiting our return to camp later this afternoon – evening. Last minute morning bits; I get my water bladder filled and of course I have my Hammer Nutrition Heed pre-mix going! John Schultz hooked me up! I have a magnetized hood so I don’t loose my body clips! Rather simple and rather simple silly cool! Schultz learned it from somewhere and we will make a little blog about it at a later date. Load in the first battery and mark the time of start. 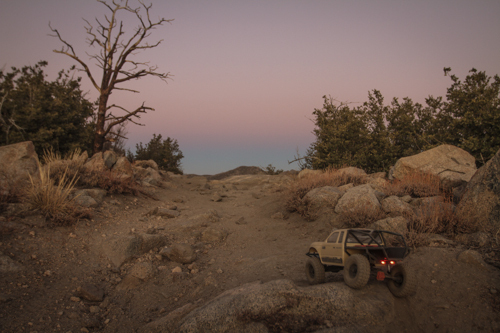 Axial Trail Honcho Hike Over Redonda Ridge OHV Trail 1W17 is now underway!!! This first portion of trail is actually down hill. Everyone is in good spirits! 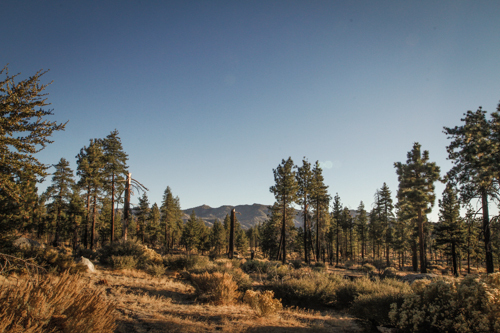 Big Bear is a mix or a transitional point from the desert to the mountains, depending on your location on the mountain, you can get a mix of cactus and pine trees of which we will see both today along ridge route to Big Pine Flats. 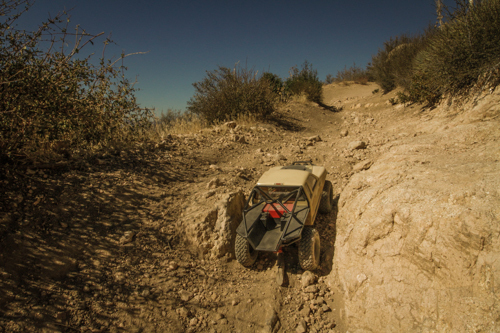 The SCX10 Trail Honcho doing what its suppose to do, trailing along. Still working our way down hill. 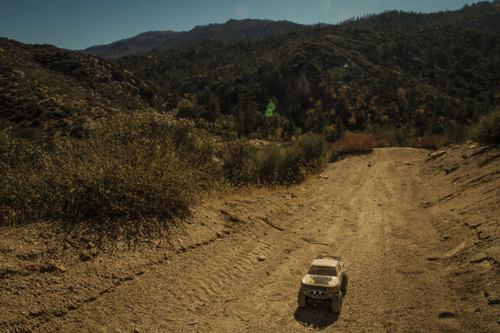 Trails crossing… should put us right about here on Google Maps. Keep on mini truckin’ hehehe That’s funny! I know all the GMC dude’s rock the #TinyTrucks tag. I’m an og Mini-Truckin’ dude! I’m going to see if I can dig that old hat out! BRAAAP! 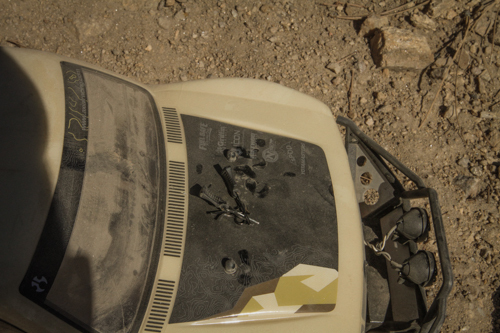 off the air craft landing strip shrapnel – the OG Sand Ladder aka Marston Mat. 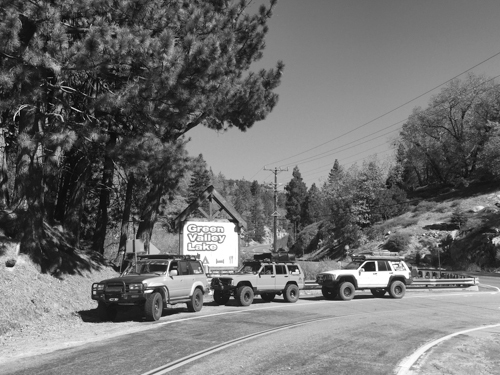 Know your overland-spec history yo! Look it up! We are almost to the creek crossing, more like stream crossing, but it is coming up soon. I’m usually the one hauling the video camera on these missions so it’s a bit strange for me to see my colleagues carrying the gear. It’s been at least a month since my previous crossing and the water level is going down quickly. Anthony Rivas got roped into hiking this trip with us and he is doing what he does best, directing some social media shots! Hey look! It’s not me on the vid-cam, it’s Scott Roberts doing the video camera action! While most people don’t see or know much about this man right here, he has worked here at Axial with me since 2011. Everything you see visually from Axial basically comes from this man or at least across his desk. Who is a fan of desert tan, green eggs and ham mixed with DJ Red Alert. Since we left the creek crossing it has become very apparent that THE ASCENT IS ON! The trail surface to this point has been mostly course sand mixed DG based. 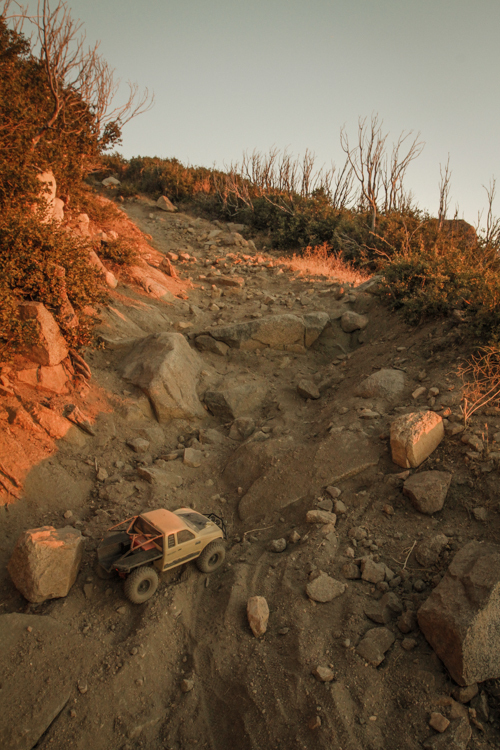 But as we continue on and up, rocks are starting to litter the trail. 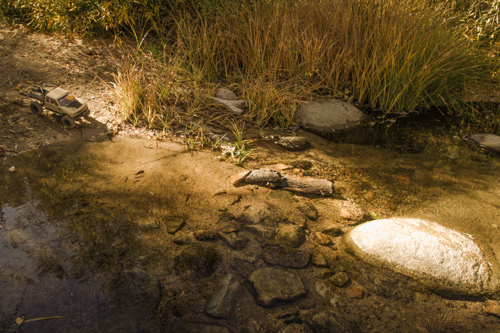 Also too, after the creek crossing, we are out of the tree cover and exposed to the sun. 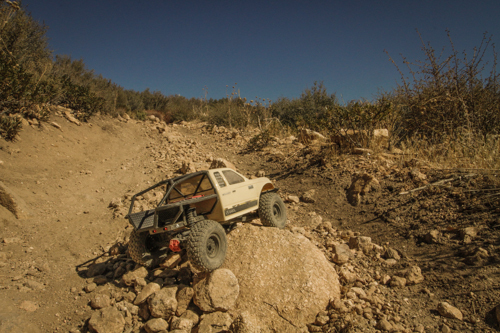 I keep on trucking as I want to get the SCX10 Trail Honcho into rockier conditions! 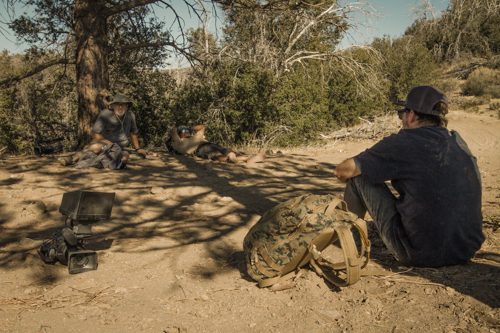 The crew finally gives up in protest about the picnic table. “We are canceling our PayPal payment!” The sun laughs and turns up the temperature and add some incline for good measure. See! Cactus… on the edge of the forest! Hey guys, where you at? Carrying on our climb dance! 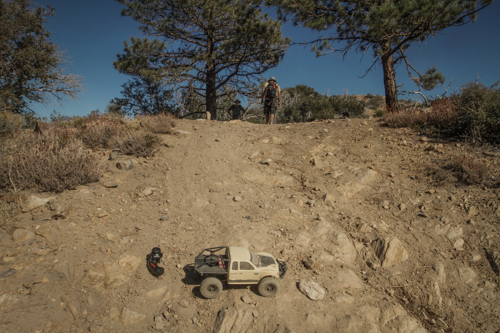 Climbing… It’s what the SCX10 Trail Honcho eats for breakfast. 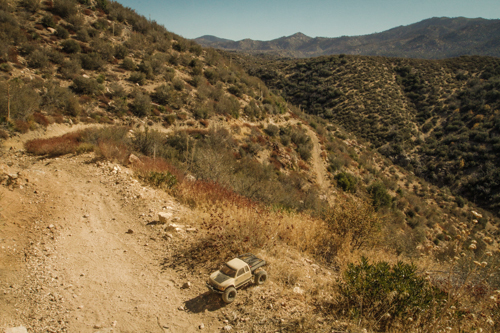 Climbing… It’s what the SCX10 Trail Honcho dream about before breakfast. 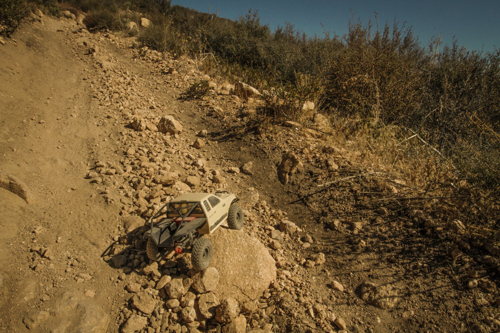 Climbing… It’s what the SCX10 Trail Honcho does at high noon. 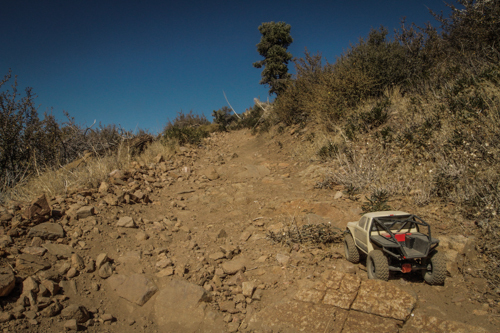 Climbing… It’s what the SCX10 Trail Honcho does just for fun! 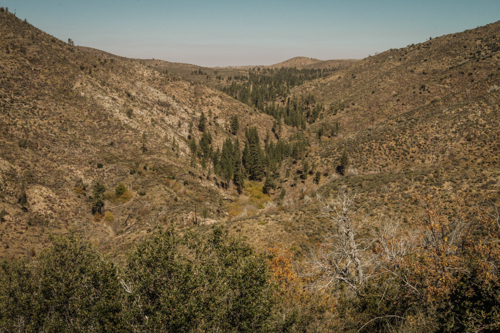 From our moment of flat perch, we get to see down this little canyon and its cool to see the small batches of trees. 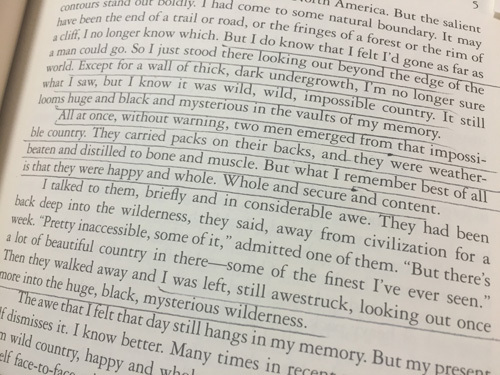 Feels like some wilderness to me! “Therezzz GOLD IN DEM DAR HILLS!!! FOOLS GOLD YO!! !” I gotta’keep the spirits high! It’s cool to see the terrain change. 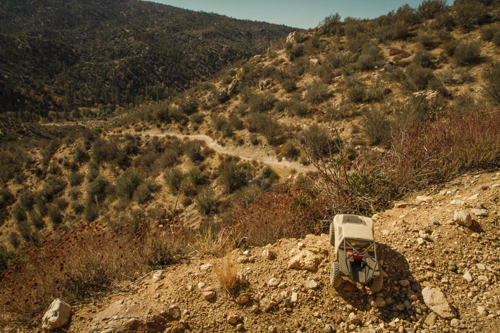 As the SCX10 Trail Honcho takes in the view, I check the spot to see what it looks like from the front. 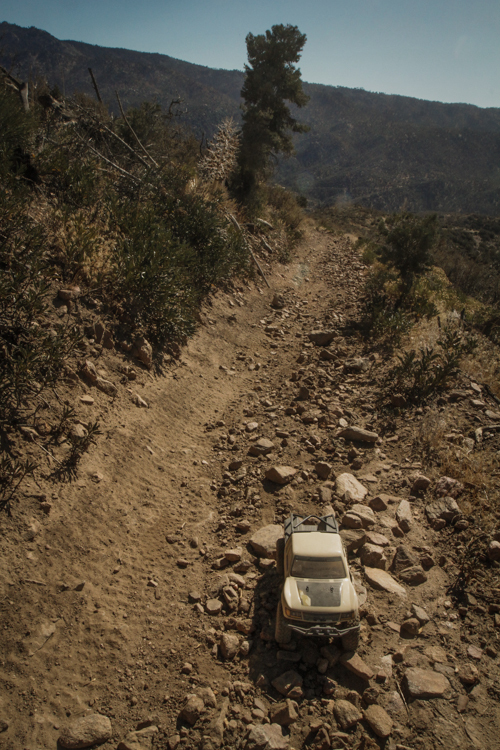 It’s not as cool of a shot but see that trail we are coming up! Yes sir, we are doing this thing! I circle back around to verify the animal footprints. Small one here, but I did see some larger “kitty cat” prints earlier, most likely a healthy bobcat. 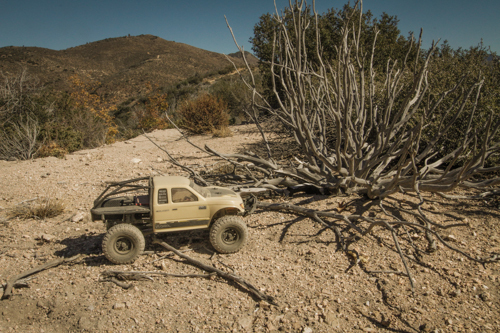 The Axial SCX10 Trail Honcho is its proper surroundings. Trail Honcho bossing the moto trail, but the gnar lay ahead. I nicknamed this “scary bush.” Especially if we was coming through here at night. 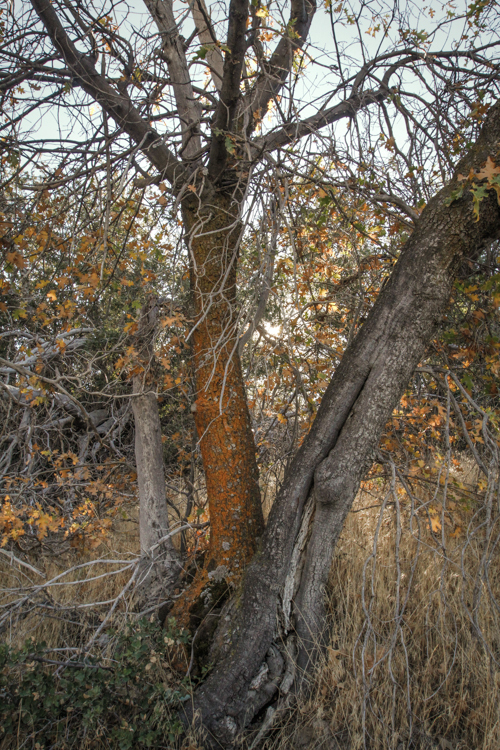 The tree is still wearing it’s charred skin from the Butler Peak fire of which I think was back in 2007. Now we are getting into some gnar! 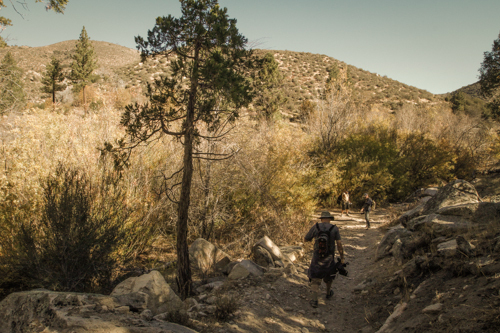 It’s not easy to get a 2D photo to show the dynamic perspective of hills and their steepness, but take note of Scott Roberts walking ahead, you get a little since of the angle here. 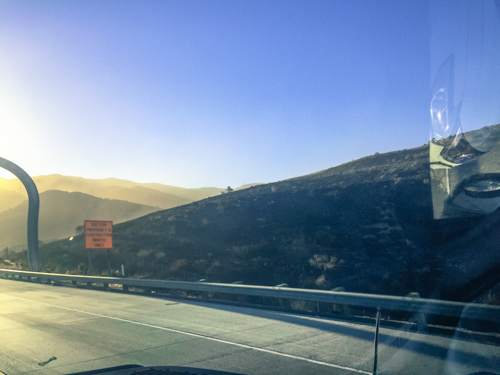 Maybe this will give you a perspective… Rest stop! 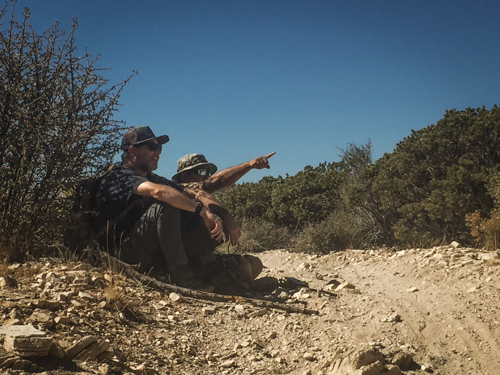 SR & Rivas taking a breather, because they can see what lays ahead… ANOTHER HILL! 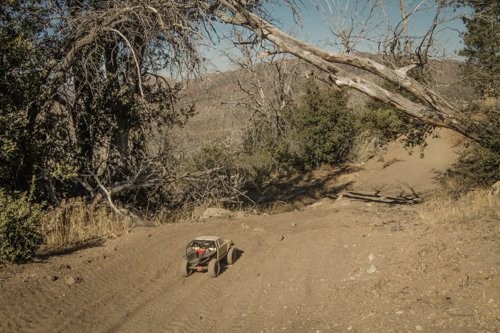 The Trail Honcho is upholding it’s SCX10 heritage and just eats up each mile regardless of steepness. 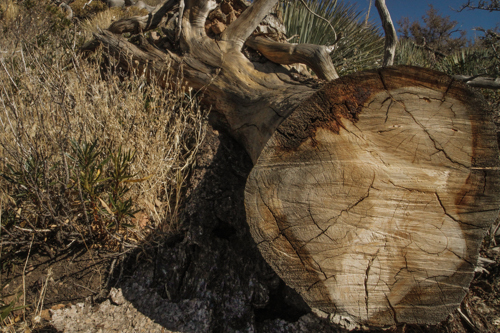 Interesting how the cross section view of this tree’s rings looks like four trees in one. 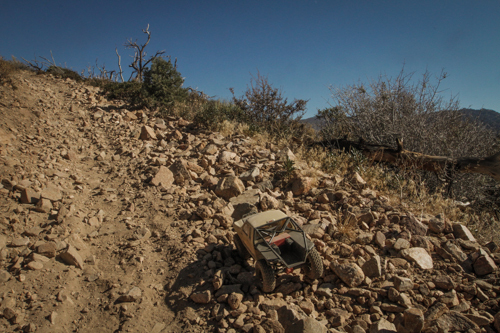 The SCX10 Trail Honcho just churning out the climbs. This trail has obviously been here for a while and been well “knobby traveled” but you have to wonder, who did it first? Who cut this trail? Was it an Indian foot path before? One day I need to stop into Malcolm Smith Motorsports and ask Malcolm directly as this trail is called the Malcolm Smith Trail. But there is very little historical information about this trail online. Same photo as the one preceding this one, but I wanted to show the ridge of which we traveled. We’re kinda’ out here! Yes, civilization is just over the mountain the in the background, but your still out here… We haven’t seen anyone else all day… and I like that. 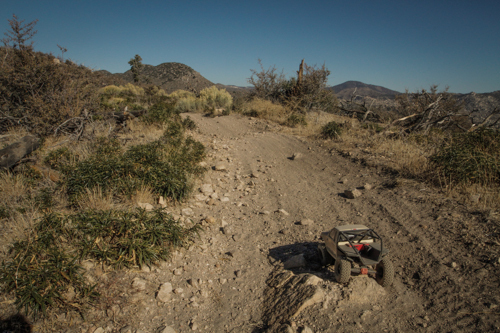 The SCX10 Trail Honcho takes the hard line just for fun I however will walk the easy path. 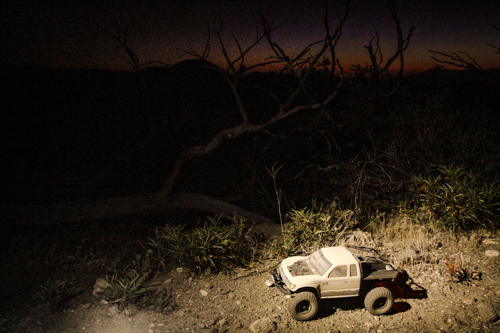 The SCX10 Trail Honcho FINALLY runs out of gas! It would… just feet from a nice shady flat area. Good thing I have my Schizzle-magnets! I’m a fan! Thanks John! Battery #2 loaded and battery #1 marked with the elapse time. Just a few more feet and my view looks like this and I join the crew in the shade. While I’ve been self-fueling all along, we take a static moment to enjoy our nutrition bars. With another crest of a hill reveals another view! 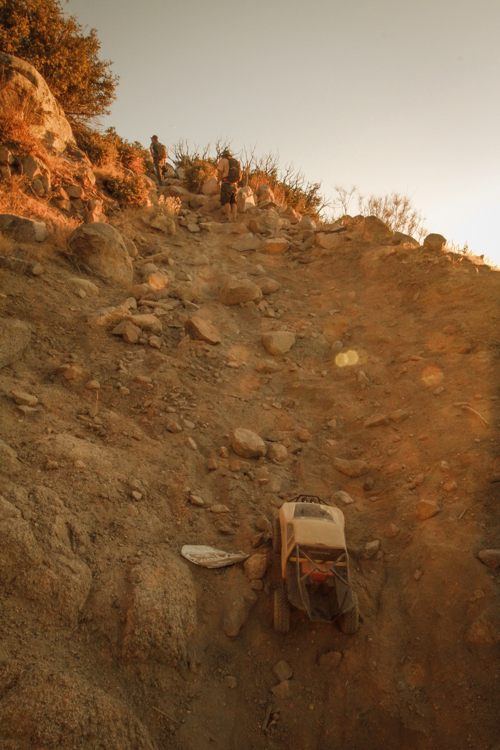 Here you get a little sense of the climb as you can see the crew pushing on. I like this shot! I think it shows a bit more of the hill but the view is spectacular! 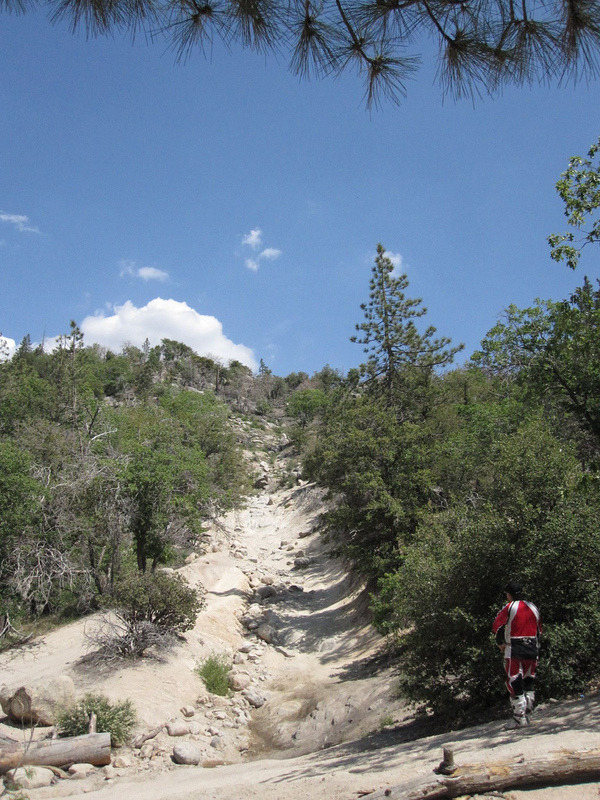 But the climb has a summit and a summit reveals more.. See that little trail thread? Talk about onion layers! We take a moment in the shade. I know you guys are on the Altra Trail Running shoe tip, but are you on the Trial Gator tip? I’m diggin my shoe gators! As goofy looking as they are, they’re total function! 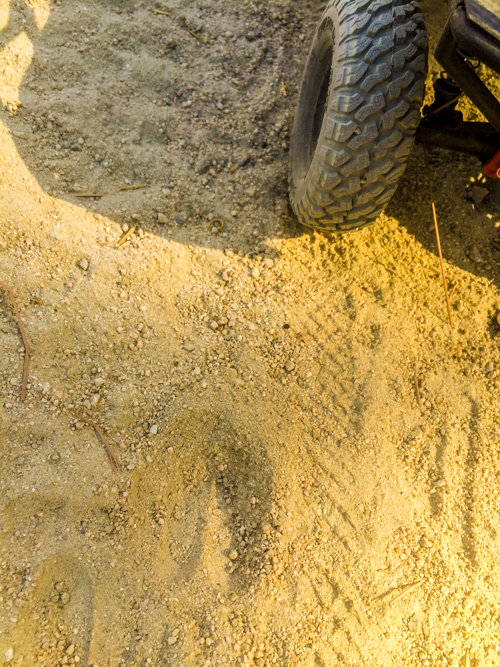 With the small gravel-DG-dirt, the gators are perfect for keeping all that stuff out of my shoes! SCX10 Trail Honcho is back in the trail saddle. 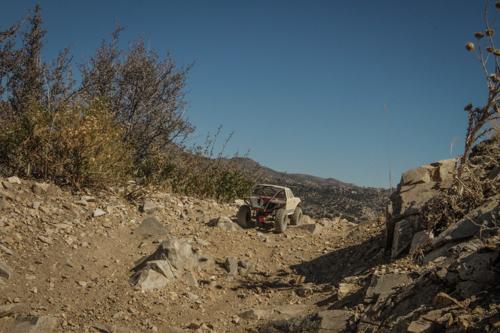 The team is working to push themselves forward as elevation and the rate of steepness has not given in! We start to get into another step section, but its been steep all along. I guess it’s more like a steep chute. You sorta’ get a sense of steepness from this view, but regardless I’m just shooting it for the view, the memory, the way the sun is flaring. 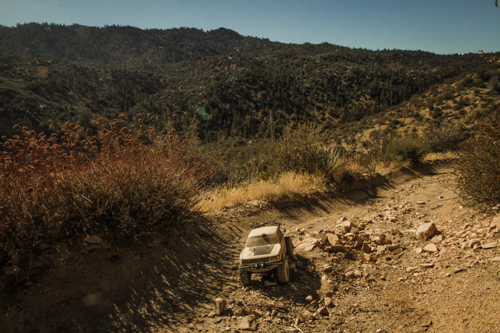 Just as I drop the camera back to my side, I’m having to get after this little section. I actually start to wonder if I can actually make this section! 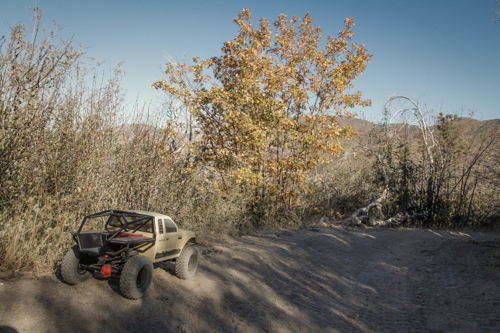 I won’t say I am nervous yet as I know I can trail blaze the SCX10 Trail Honcho around if I have to, but it will be limited space to do so. 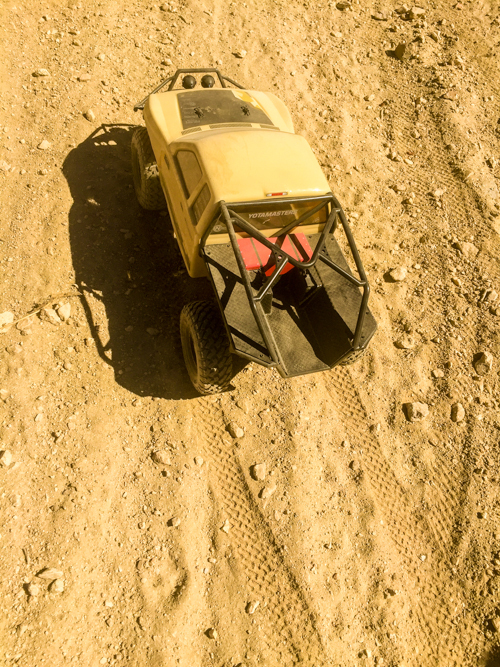 I stay in the trough or chute of a trail and work the rig through the boulder and then in the deep heavy granular sand or DG – decomposed granite. 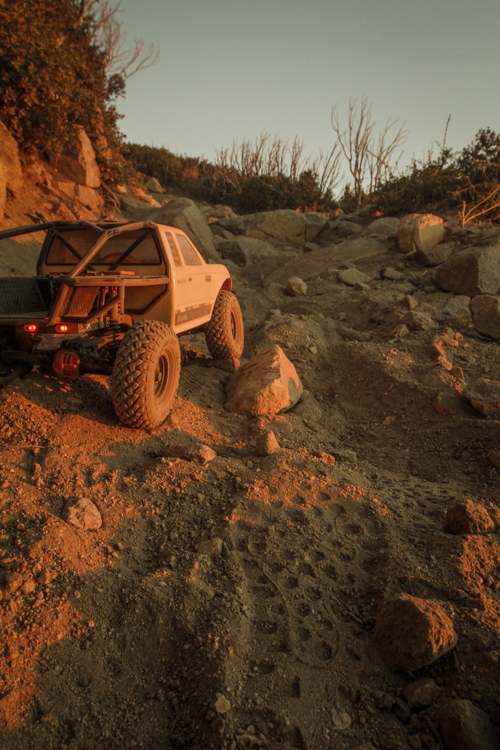 The combination of having to use wheel speed to push up hill in the DG while also the tires dig down and find bite on the rocks below… I hear it… Wait, what? I don’t want to hear that!!! OH NO! NO FORWARD MOMO.. MO – MOTION! 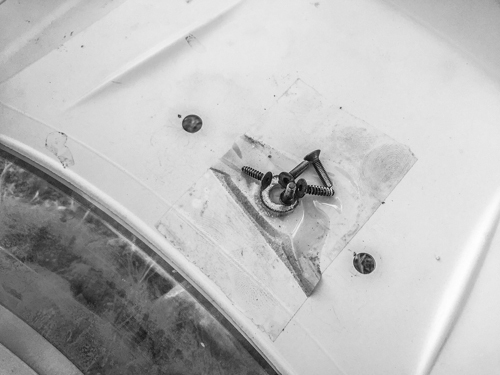 Again, dig the magnet trick as we can drop the screws here on the underside and the body clips are on the top side. 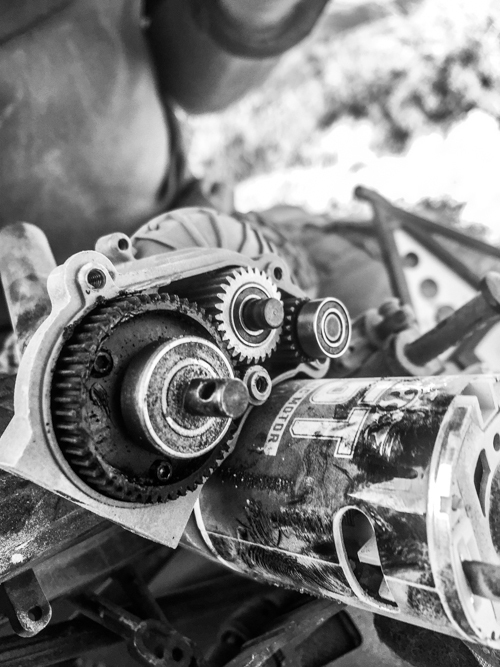 As suspected, idler gear gone fishing for the afternoon. We fish out what debris we can in preparation to install a new gear. Field repair is almost complete! Buttoning it all back together and we will be back in action in moments! As you can see, there is a cleaner easier path to take, but what is the fun in that?! 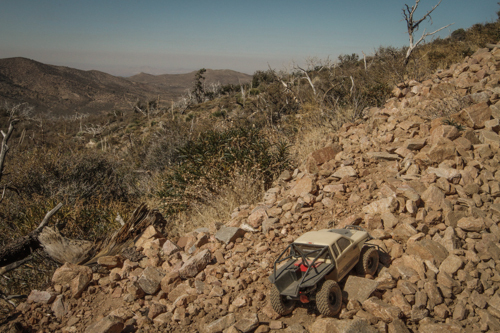 I came here to put the rig through its paces on the rugged trail of the Redonda Ridge. I could have just stayed home and drove circles around in the parking lot, but that is not my idea of fun! 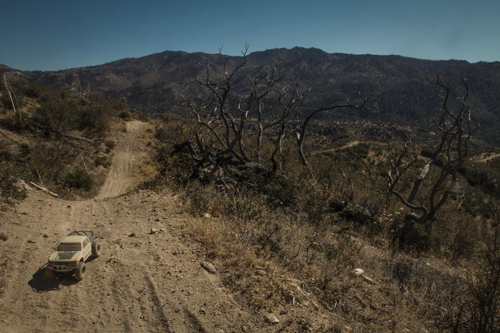 Being out here is fun, while it is both grueling on my body and the SCX10 Trail Honcho. But it’s worth it as it’s an additional layer of testing. 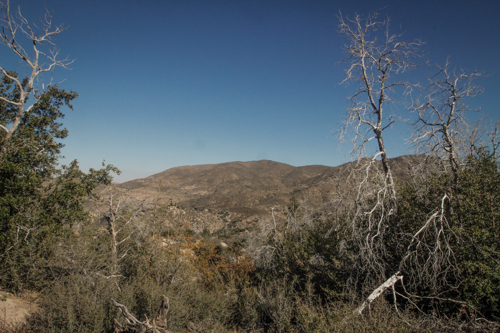 These climbs also showcase some scenic views! 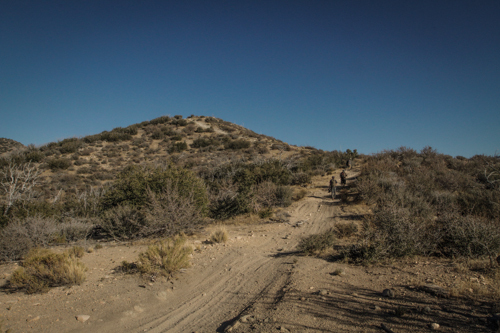 Photos never seem to capture the true steepness of a hill, but looking at ScottR and Rivas as they make their way up, shows a bit of how steep this section truly is. 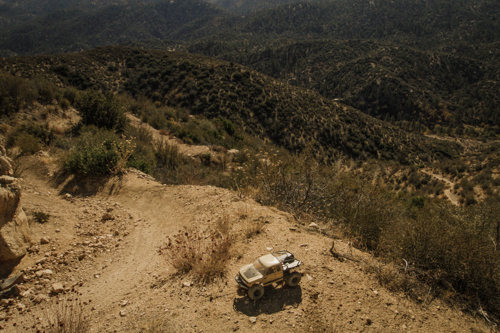 When I begin to question if I will be able to drive a section due to the steepness, I really start looking creative driving lines! 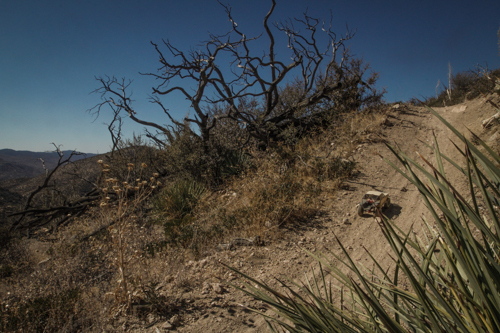 When you see motorcycle parts on the ground, you know its a tough section. Rivas making his way up. 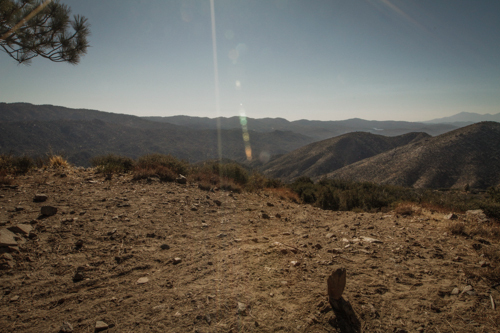 The team has come to the conclusion that there is no end in hills, they just keep rolling at us. Only to discover around each bend, more hill! And more hill it is! The lighting from the sun is just awesome! 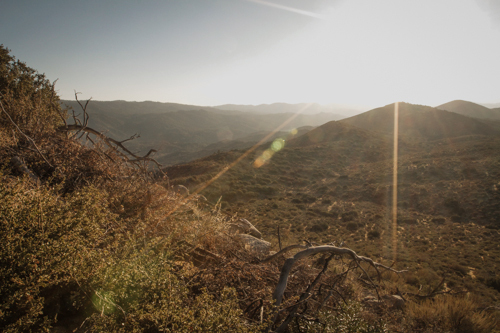 We are within the “golden hour” and I could sit on this hillside and shoot till dark! But, I only snap off a couple and keep moving as I knew we have at least a mile or two further to go and we will be hiking in the dark. 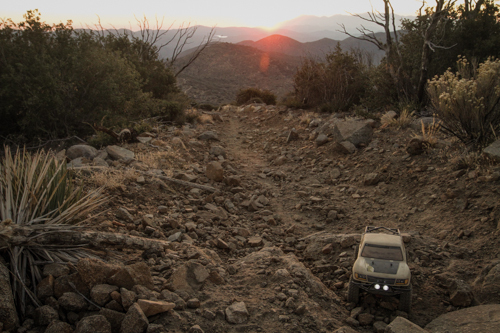 The sun is is about to drop behind the mountains and the ground bush on our mountain is blocking some of that light, but we finally made it through that section! You just want a lounge chair and a big dinner as this is the perfect wide-screen! 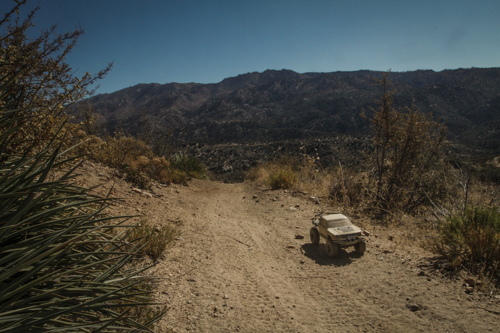 But we must keep going, the SCX10 Trail Honcho marches on! Another big boulder garden! Who plants these things?! Who would want these things to grown like this? 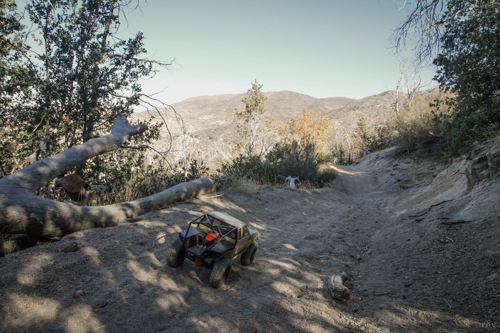 The SCX10 Trail Honcho makes no worries of such matters and see’s only the playground in mother nature’s garden of rocks. WHAT?! A moment of downhill or even flatness is a happy moment! 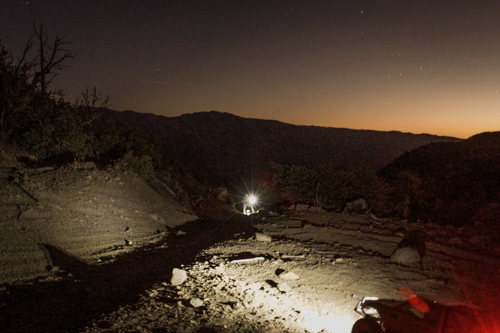 Only to be defused by another uphill climb as Tony makes more reveling with his headlamp that we will be engulfed by darkness on the backside of this climb. Everyone is beat tired, but the view is magical. There is both excitement and angst in the air from the crew. The hills are behind us, the darkness is ahead of us. 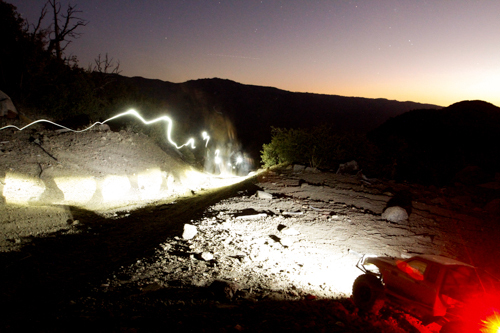 Hike team headlamps streaking by. 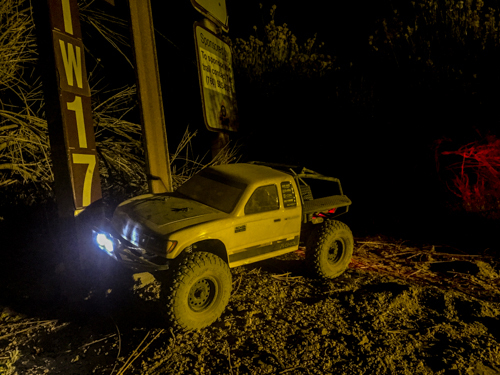 The SCX10 Trail Honcho awaits the last of the team to pass for the final view of darkness and the final decent to the trail gate at Crab Flats. The end is near, just ahead down a dark mountainside with ZERO moon light. 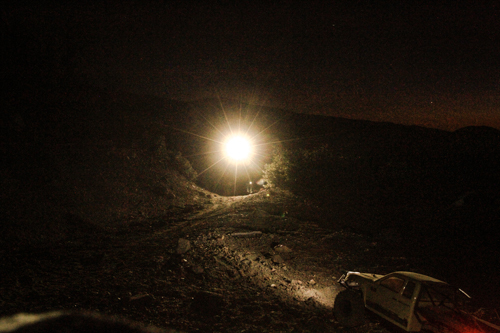 We make our way down and ScottG is awaiting us, with lights on in the rig, we can see how much further we have and the excitement builds for the team! “GET US OFF THIS TRAIL!” is what a think I heard! WE ARE HERE – WE ARE HERE – WE ARE HERE!!! 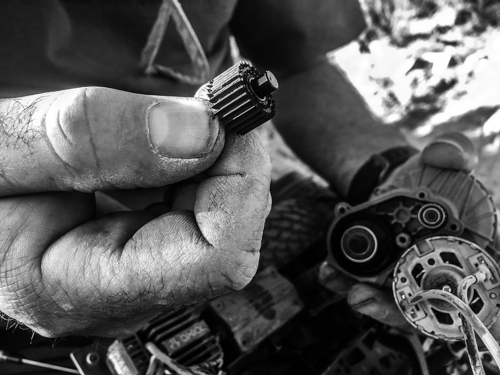 We extract the third and final battery out of the SCX10 Trail Honcho and mark the times. This trip epic, awesome, fun, grueling and was a big learning curve! The crew will forever remember this trip! That’s a wrap! 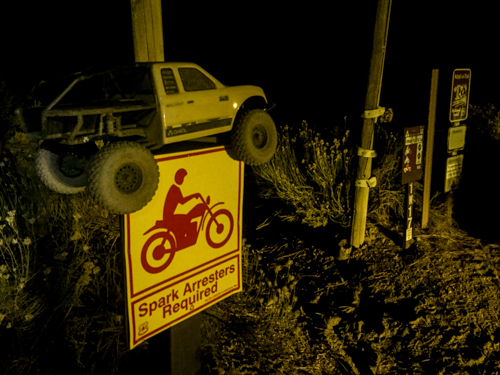 Spark Arresters Required! Back at camp, ScottG aka “BKGriller” makes HAMBURGERS for the HUNGRY!!! 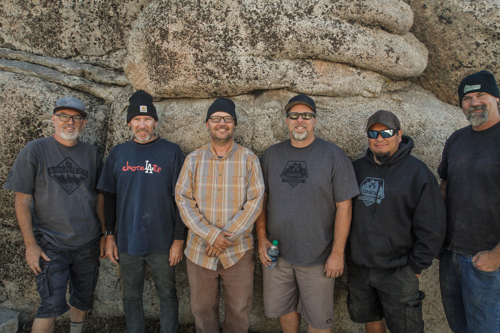 [L2R] Tony Phalen (cam-2), ScottR (cam-1), Rodney Wills (SCX10 Pilot), John Schultz (team basecamp & rig prep), Anthony Rivas of Rivas Concepts (guest & social documentary) ScottG (team basecamp & trail transpo & chief). 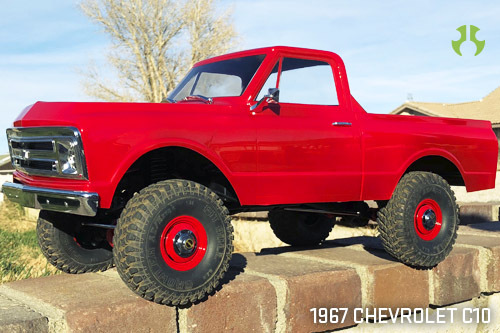 Rodney Wills may not have been born with a silver spoon in his mouth, but he was more than compensated for it by being able to grow up behind the wheel. At eight years old he started driving heavy equipment on his uncle’s farm. Flouting child labor laws, his uncle would put him to work; he would get him started and jump off the tractor, and have Rodney cut and plow fields. The uncle found Rodney a willing employee. Now, while he did not engage in any tractor races, the seed had been planted (literally); the passion for driving already raced through his veins. Later on in Alabama, Rodney would drive his father’s old pickup truck. 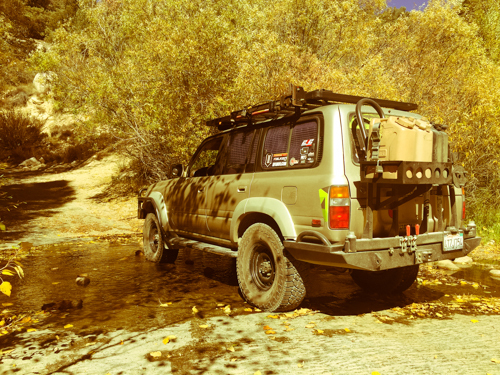 As young teenagers sometimes do, he would sneak the truck out to splash in the mud on the local country back roads. 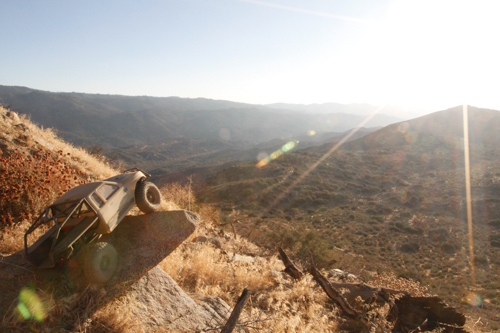 Rodney did not limit himself to four-wheel rides, however. Motorcycles were always apart of family life and Rodney had started riding at age five. Racing came at age six on the dirt oval flat track at Talladega. 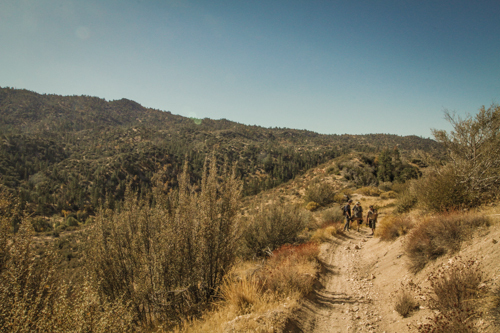 Trail riding was an everyday thing in the backyard woods and local mountains. Magazines would introduce Rodney to skateboarding and then BMX in 1977. Normal by today standards but then in rural Alabama, Rodney was way ahead of his peers. Just like his hobbies, his life went in the order of Art, Music, and Cars. His passions led him to the California College of Arts and Crafts after two years at the Atlanta College of Arts and Crafts. 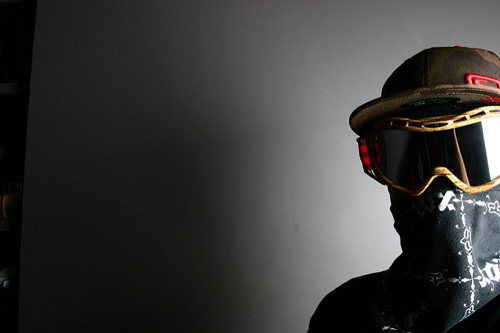 After achieving a bachelors degree of art in graphic design, Rodney went on to work ten years in the snow, skate and surf industry through his art, working for the famous O’Neill wetsuit company. 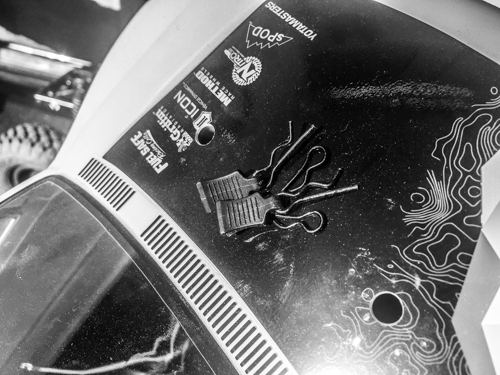 Next came music as the art director for the car audio speaker manufacturer Image Dynamics. 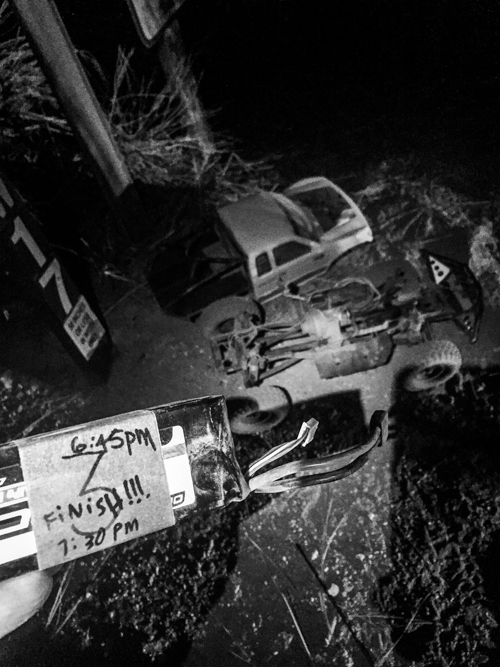 That led to Rodney starting the import car culture lifestyle magazine, TMRm’zine [1996-2000]. This magazine put the “lifestyle” label on the import market that has now grown to enormous proportions in the automotive industry. For the next 10-years Rodney worked in magazine publishing. 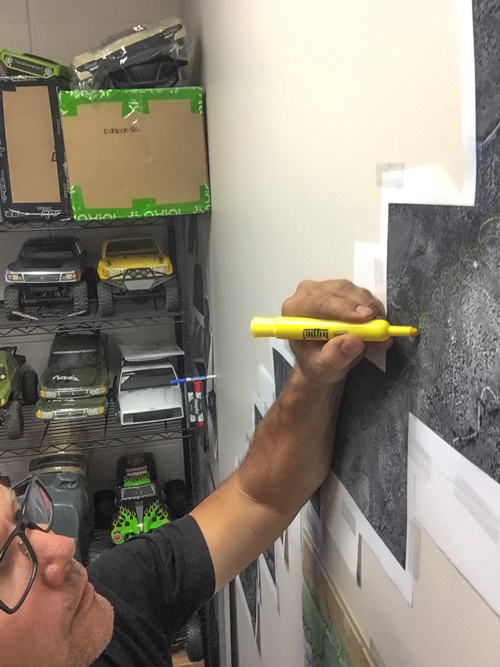 During a meeting between colleagues, Wills was helping an event promoter make his event better, which lead to a more in-depth connection to the R/C industry pulling Rodney in to work for HPI Racing [2006-2010]. 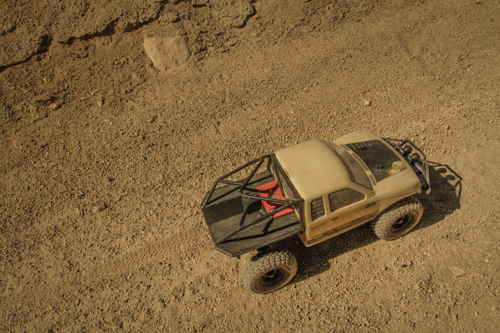 Since 2010, Rodney has worked for Axial as Global Marketing Director coming up with wacky ideas such as this. Logistics logistics logistics, what do you mean the log is tics? Who said tics? What log is full of tics?! Get the gas! I’m bringing bug spray! Who’s got grey spray paint?! “Logisticmundo’s” will NOT be televised on Telemundo at 7:00pm to protect the innocent of the children. 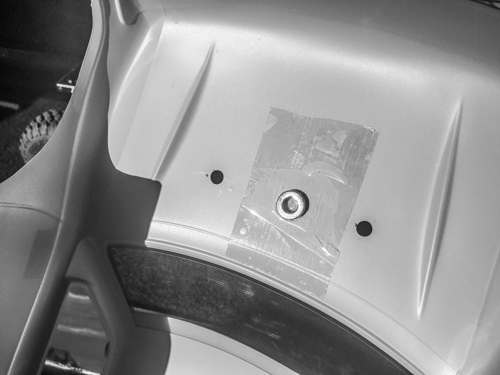 Does that mean that it’s logical to just use bondo? The logistics of looking after your crew is like looking after your kids! Add in adventure and the stakes increases six-fold. No, not the ones on the grill, the risk-factor! In all seriousness, six persons coming from six different directions and we only need-want two vehicles for our mission, this requires some sorting the details out! We will actually have three vehicles in use for this trip; ScottG is picking up ScottR, Rivas is driving to Schultz’s house and riding with him and I am picking up Tony Phalen from his house. No, ScottK is not on this trip as he is holding down the office-fort. Three “Scott’s” one office, I got it sorted! 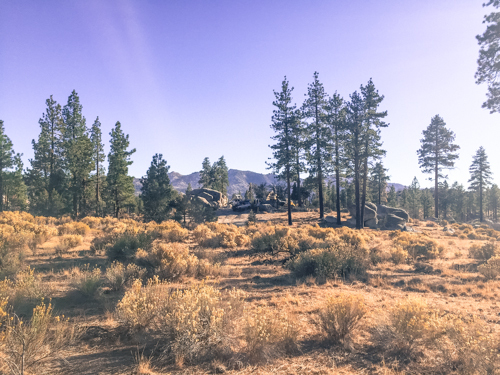 “G-K-R!” What we will be doing is traveling from our six personal locations and all descending onto a camp location nestled north west of Big Bear lake called Big Pine Flats. 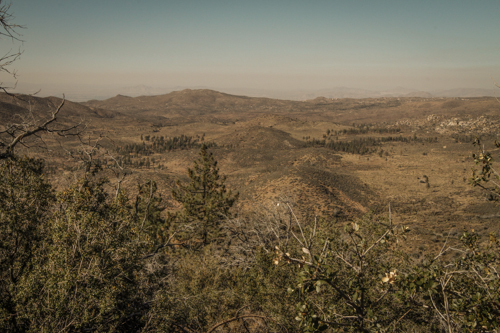 This area was chosen as discussed in this previous blog post: Planning a SCX10 Hike over Redonda Ridge OHV Trail 1W17 (Hence the mild suggestion, “Hopefully you’ve read these previous blog post…”). All kidding aside, lets get on with this operation! We are traveling along the 91-FWY just before the HWY-241, the area where the Canyon Fire broke out and took some homes. The burned homes are visibly up on our right, but what I was looking at was the “burn-dust” coming across the hills as the wind is still blowing strong. 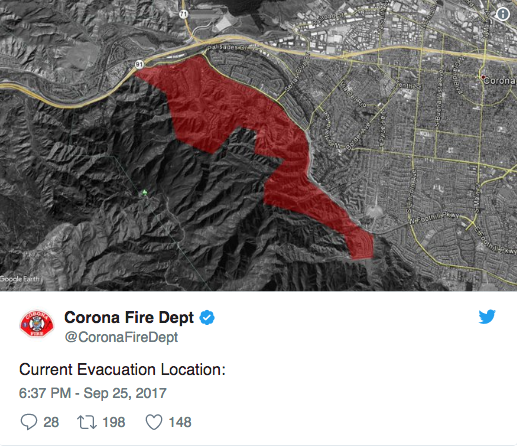 We’ve seen our fair share of fires in southern California and as I put the finishing touching on this (December 12th, 2017) “At 230,000 acres, Thomas fire is now the fifth-largest wildfire in modern California history” as reported by the Los Angeles Times. Needless to saw, we will have a watchful eye when we are in the woods. We are all traveling from three different directions to the mountain. 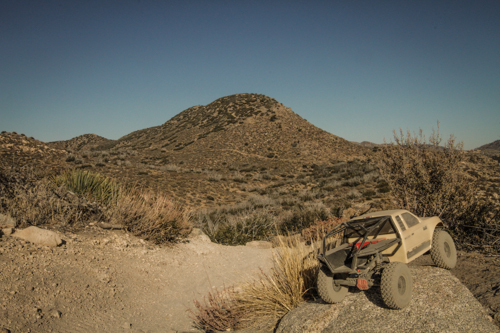 While in route, Tony and myself were having a good chat and I drove right past my exit as my brain was thinking I was driving to King of the Hammers. Guess what we was talking about… The first two guesses don’t count. We wound up coming in the same way and meeting on the road Schultz & Rivas. 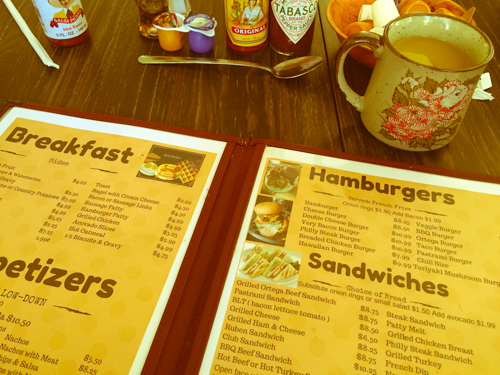 Our meeting point before going into the woods is the Deep Creek Drive-In Restaurant in Running Springs, California, serving Burgers, Taco’s and BREAKFAST! The last meal… It’s the joke of the morning. 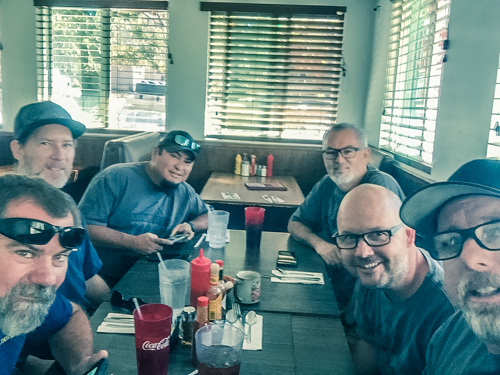 in good company with (L-R) ScottG, ScottR, Anthony Rivas, Tony Phalen, Rodney Wills (me) and John Schultz. 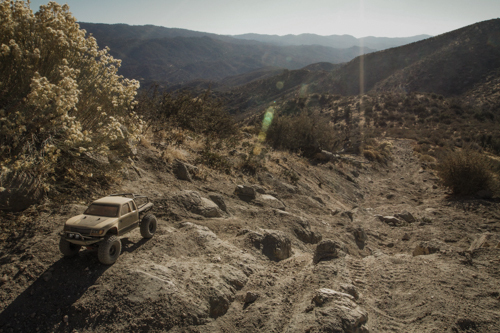 We are packed into these three rigs; the #ADV80, the #XJSchizzle and the #SHTFV. What would be funny is all six in one!On our way into Green Valley Lake, we see this rig up for sale. But someone had to go off and buy a 6X6 instead. 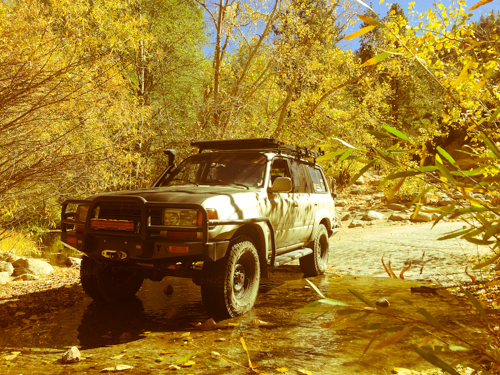 Poser shots of the ADV80 at the intersection of Holcomb Creek, Pacific Crest Trail, 3N16 and 3N93 Google Maps Link to this spot. 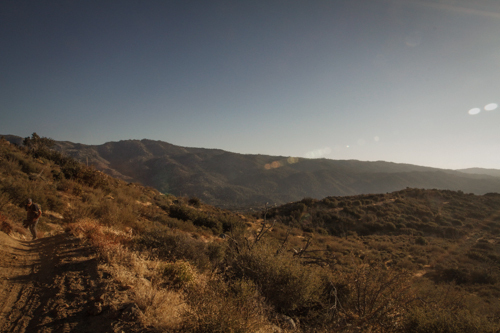 This dang PCT trail just keeps talking to me! 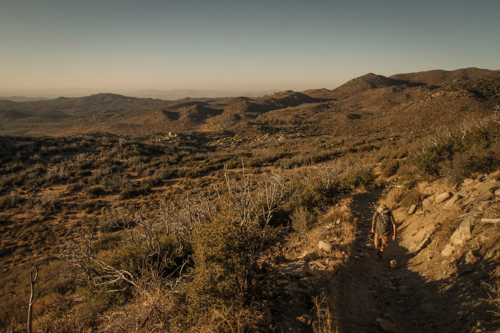 While the thought of through-hiking it is everyone’s dream, it’s truly that, a dream. 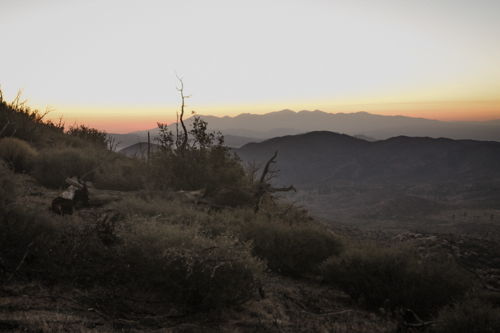 BUT, we can weekend section-hike southern California section of the Pacific Crest Trail! 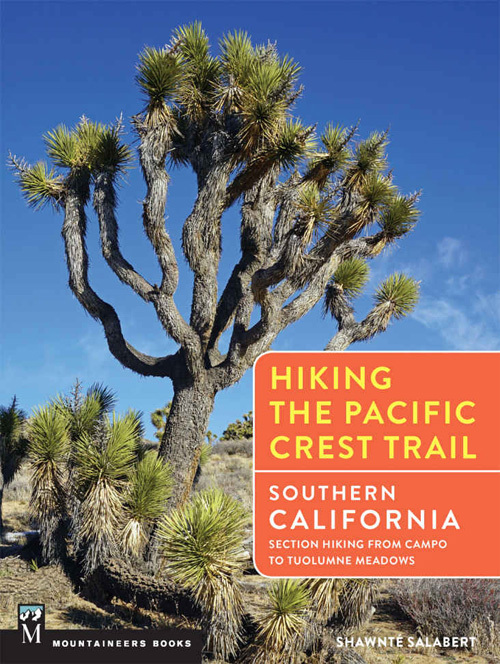 Thus, I have recently purchased the book Hiking the Pacific Crest Trail: Southern California by Shawnté Salabert. 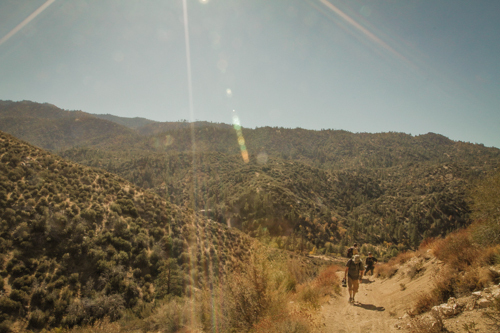 The crew coming up from the Holcomb Creek / PCT crossing towards the Big Pine Flats Area. The “Family” campground there is closed for the winter season, but I didn’t want to stay in there anyhow. 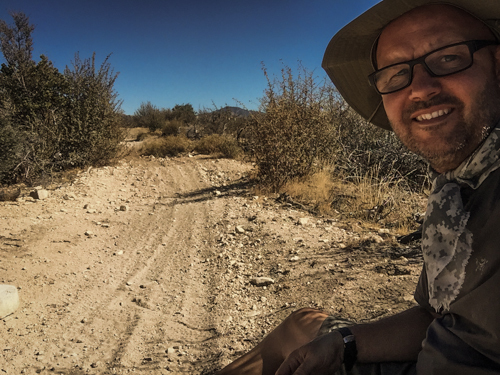 I like camp spots that are as remote as can be, but for this trip I need convenience as the trail that we will be hiking ends near by. This is YP #7. We make camp on this small hill top just off the road. Tents are located as best possible out of the wind. But those RTT guys throw caution out with the wind just toss it up where’evz! SR looks on and informs us we are doing it all wrong! This needs to be drilled and hollowed out of the rock, add the front porch and fireplace here please. Camp GCRad1, I try to be the minimalist of the bunch. 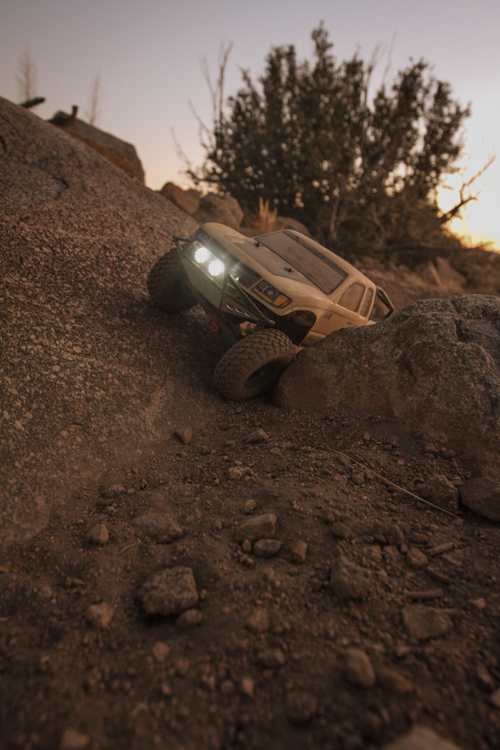 Once camp was set, an SCX10 DEADBOLT DRIVER CHALLENGE BREAKS OUT!!! 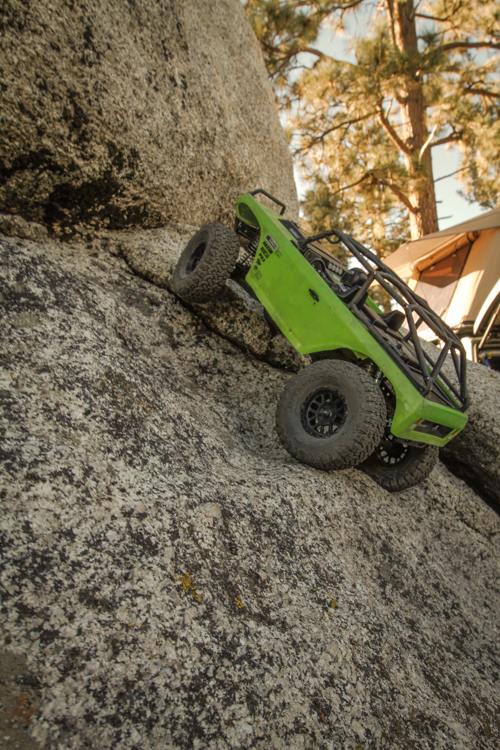 Granite’s got grip! 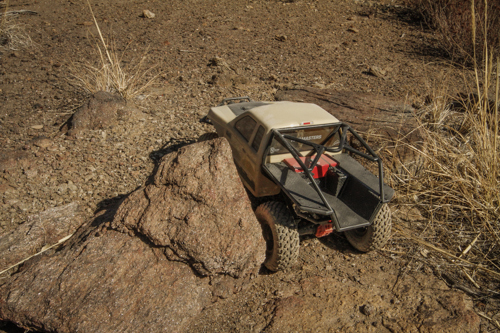 At least I hope it’s granite, I’m no geo-rock-hound, but we are hound dogging this rock with the SCX10 Deadbolt with a game of RC horse of course! The game play rules are simple. One rig, everyone gets a chance on the wheel. Roll-3, pass the wheel. Follow the leader, standard issue camp-rules. ScottG – still got game! Look at that concentration! This is serious! Big bragging rights are on the line! 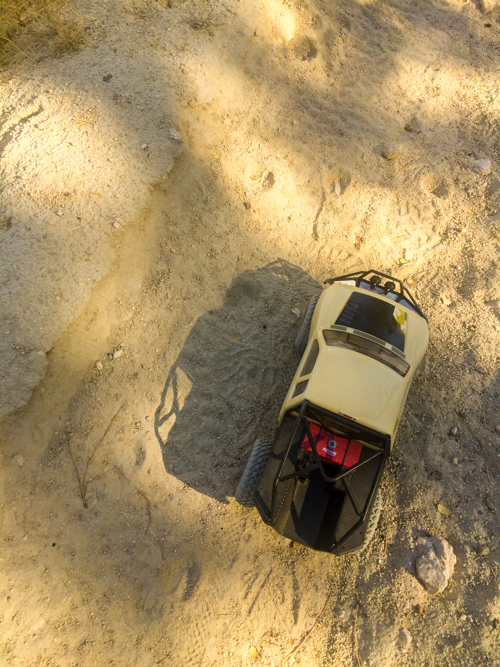 The fun of R/C – this is as PURE AS IT GETS! The wind was a bit howling as the night set in. It was a bit cold and no fires were allowed at this time due to the high wind. 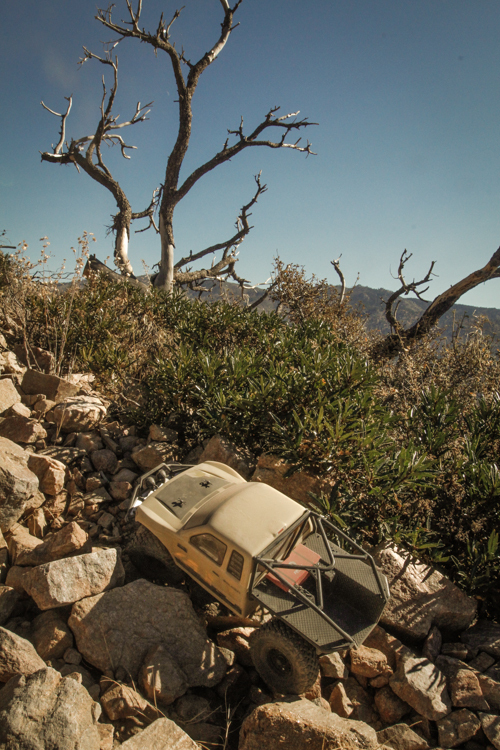 With the recent fires we just had, we didn’t want to contribute to the destruction so we didn’t have a camp fire. Bit of a spoiler. 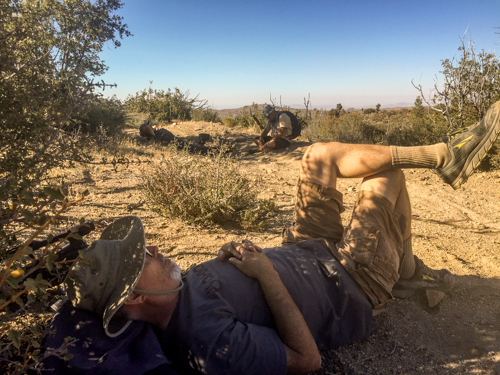 We went to bed early thinking we would get some sleep and awake early, charged and ready for tomorrows pursuit…. WRONG! 1:00am and EVERYONE IS AWAKE and crawling out of their tents. The wind had died down by this time, but we were still awake. We mill about in camp for a short bit, raid the snacks and back off to bed. 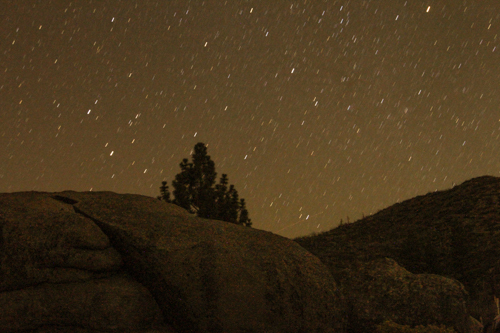 I snap off a couple of long exposure with the camera sitting on whatever was available to hold it steady enough. Time to try and get some sleep! I think the anticipation in killing me! 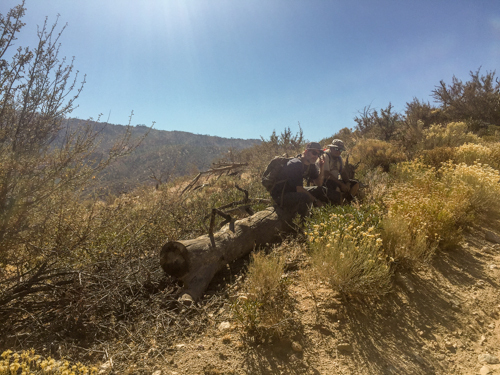 Hopefully you read the blog post “Planning a SCX10 Hike over Redonda Ridge OHV Trail 1W17.” Upon recently riding over the Redonda Ridge, I was inspired to come back and SCX10 hike this trail! 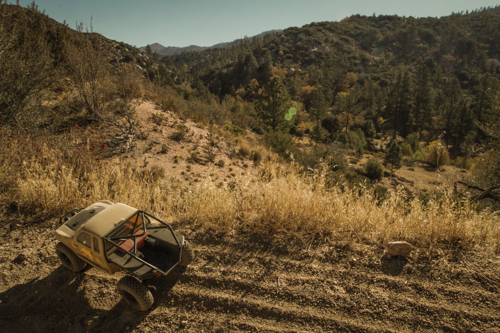 I just wanted to do something in the namesake of the vehicle; on a “honcho” of a trail! 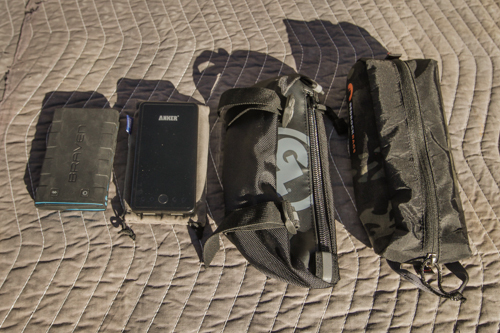 This was no walk in the park and I wanted to have my pack properly sorted for this trip. Pack of choice for this trip is my London Bridge Trading LBT-1476A Standard Three Day Assualt Pack. As previously stated, just choosing the pack is my hardest decision almost every time! It’s shouldn’t be.. But I’m a bit of a “gear junkie” and “bag lust” is at the top of the pile! 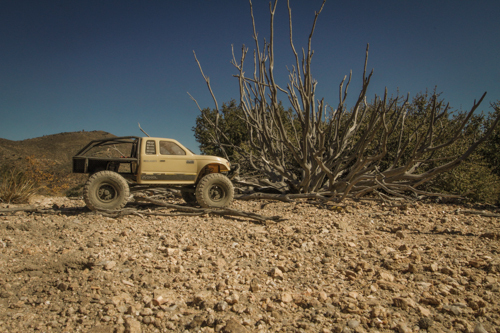 For this trip I am not just hiking into a remote location, I have to carry R/C batteries, tools and spares for the rig. Plus, I will most likely be carrying camera gear. Even though I am not shooting the video for this trip, it’s my nature to document the trip on a personal level, but at the same time, I have yet to find a specific camera pack that suits the other carry needs. 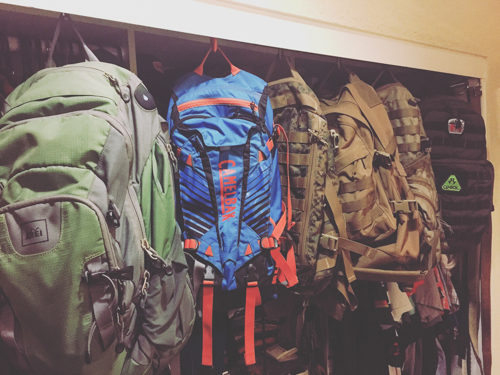 The basic theory in packing is the systems approach in that everything going into the pack needs it’s own storage-pack or bag. I’m getting better at the systems approach to packing, but it’s been a long hard battle as I would typically just throw everything in the bag and go. But, I jump from pack to pack often and some things would get packed and some things were getting accidentally left behind, depleted or accidentally ON! The simplest thing to stock every pack in your house with, is toilet paper. You don’t need it until you need it and if you didn’t prepare, you have to cut your trip short or you going to be minus some shorts or one sock. 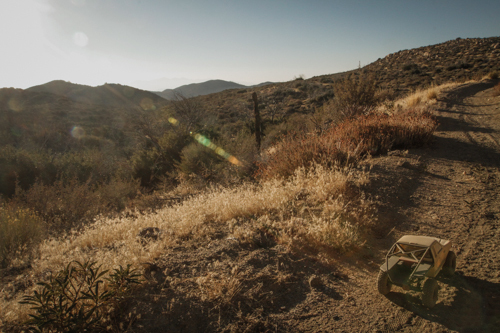 Don’t waste your efforts to get outdoors. Thank you zip lock bags! 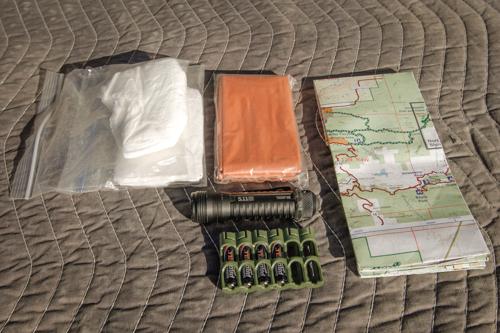 In this pack I have my TP, emergency shelter (orange item), flashlight and spare batteries. The map is the “floating item” that will get changed out depending on the mission. 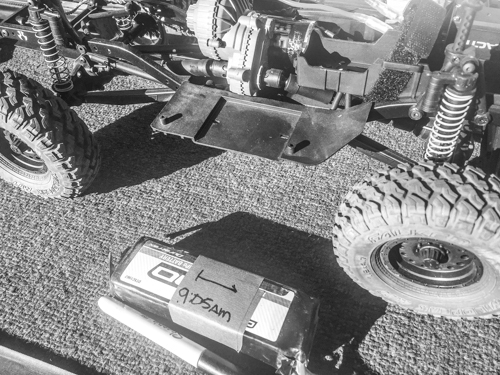 Two USB battery packs because my cellphone is dying the slow death and the what if we have to stay out longer than intended… The Giant Loop pack will carrying my R/C tools for this trip. 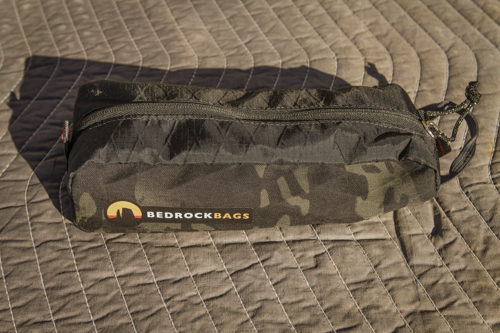 The Bedrock Bags is carrying nutrition. 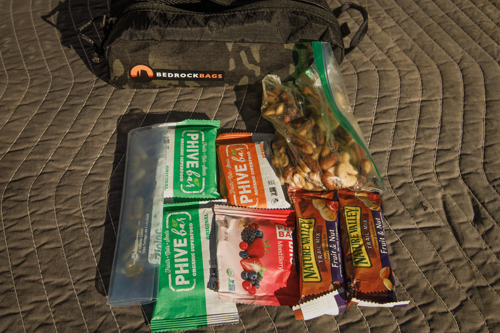 Inside the Bedrock Bags is Nutrition! Food is IMPORTANT and I like to eat! For a day long trip I have 6-nutirion bars, a bag of mixed nuts (something natural) and the small zip lock has my “old man” Hammer Nutrition vitamins. Just as we were about to leave I grabbed two more bars… Just in case! The Giant Loop Zigzag Handlebar Bag is a new bag for my moto that just came in right before this trip and due to his heavy construction it carrying my R/C tools for this trip. 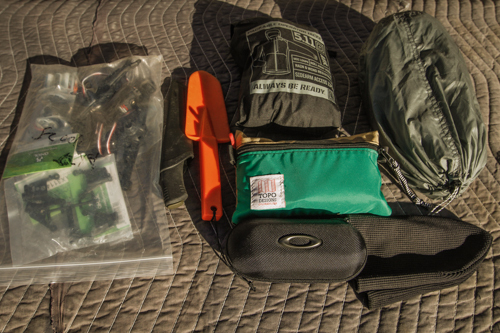 Because the SCX10 requires massive amounts of tools, I have a long laundry list of tools required to carry on-trail, hence the heavy-duty bag! HAHAHAHA! This is my minimalist R/C tool kit that only consist of 7mm nut driver, 1.5mm hex driver, 2.0mm hex driver and a pair of bent needle nose pliers. MASSIVE! 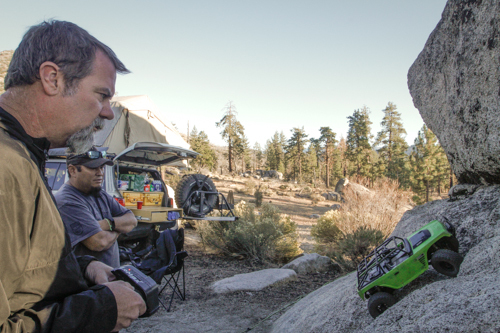 Here at Axial, we’ve been fans of BRAVEN! 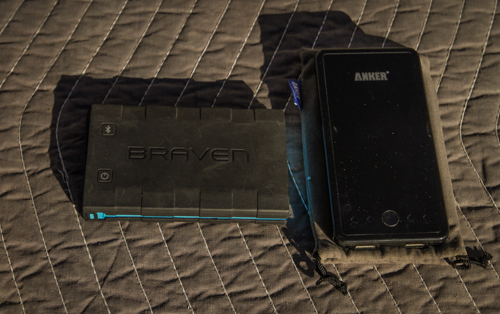 I’ve had this Braven BRV-BANK Ultra-Rugged Portable Backup Battery for a couple of years now and it has been great! The BRV-BANK revolutionized power on-the-go as the world’s first Bluetooth®-enabled, USB-controlled power bank. The ANKER Astro E3 Ultra Compact 10000mAh Portable Charger was my first power bank, but was more for my business trips as it is not as rugged, nor waterproof. I carry it in a neoprene coozie sleeve and inside a sunglasses case. I found a great use for my Oakley sunglass Soft Vaults! I can put two Petzl headlamps in here! 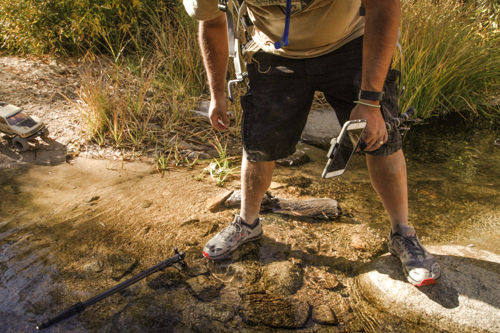 Why do you want to put your headlamp into a protective case? I’ve reached into my pack and pulled out a head lamp that was on or already with dead batteries due to the button getting pressed. 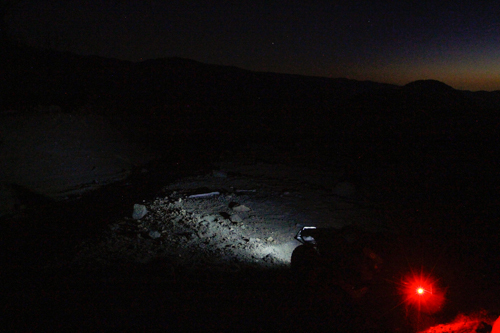 Too many times this has happened at a time when it would have been nice to have a head lamp! You may notice I’m a little bit over zealous in the light department has I have a backup flashlight and a pocket light as well. 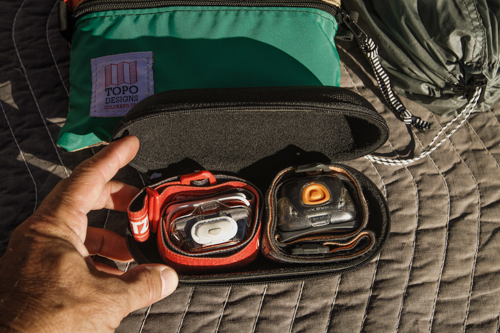 First Aid & supplies are carried in the TOPO Designs Accessory Bag. 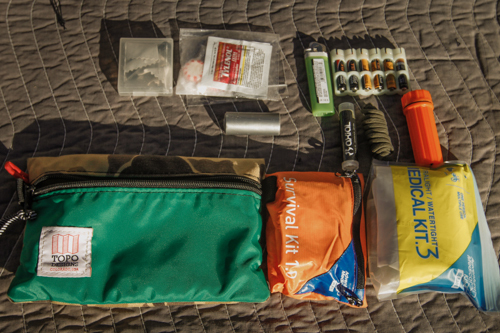 Contents of the First Aid bag are: Adventure Medical Kits Ultralight & Watertight .3 and a Adventure Medical Kits Survival Kit 1.9. Little box on the top left is magnifying-tweezers and I’ve used it a ton! Much better tweezers that most medical kits. Second little bag is self explanatory with the Tylenol & Peppermint. Silver roll is duct-tape to use for blisters BEFORE they become blisters. Backup lighter as I usually with have a lighter in my camp stove kit bag. But because the camp stove is not on this trip, it’s good to have one in this bag. Additional AAA batteries. Axial Chap stick, para-cord and waterproof matches. All this is ready to jump from this bag to my moto bag in one grab! 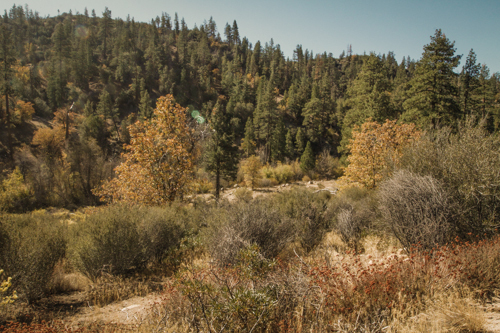 Layers, layers, layers.The season is changing and in the mountains, weather can change on a moments notice! I pack a thermal top, long-johns and a pair of socks. 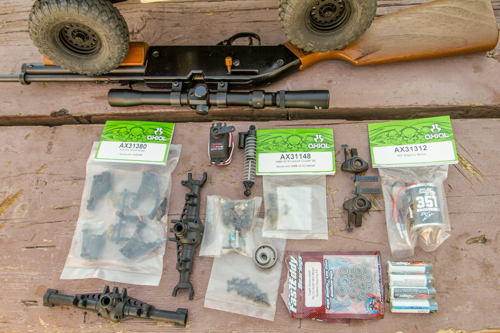 All this packs into a lightweight pouch made by Aerostich. 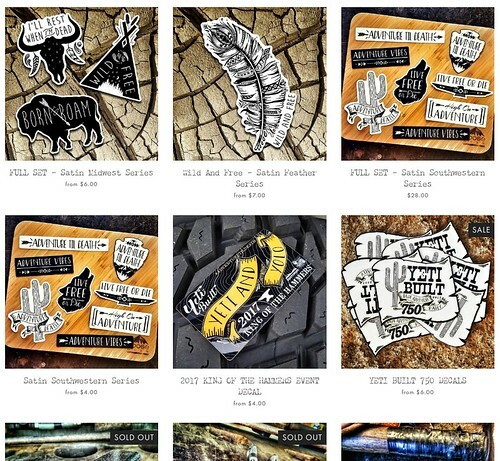 Aerostich is another one of my favorite companies who is a supplier to motorcycle riders especially in the adventure-travel market. 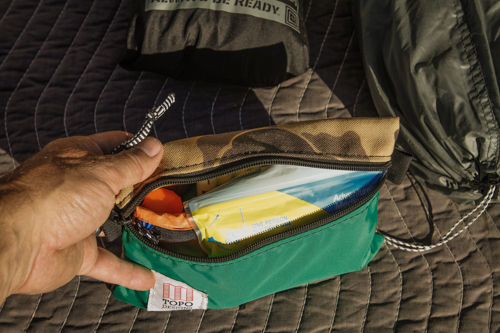 They have these affordable Ultralight Stuff Bags from $7 to $12 in five sizes. 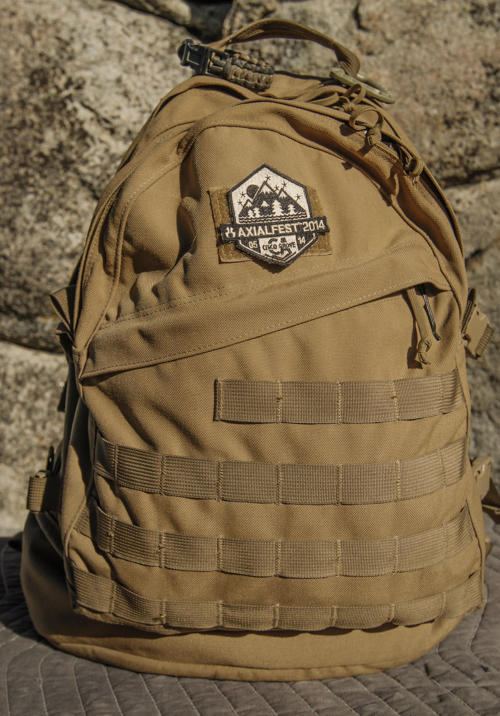 In the top photo (not this photo) you may have noticed the 5.11 bag as it is the 5.11 Tactical Packable Jacket. This thing is AWESOME! It’s quickly deployed wind resistant protection against unpredictable climates, the Packable Jacket folds easily into its own carry pouch and easily packed! I think through London Bridge Trading I discovered Source. This is the Source WXP 3L Storm Valve Hydration System with their exclusive 3 layer co-extruded Polyethylene construction with Taste-Free™, low maintenance, Glass-Like™ liner. Integrated Grunge-Guard™ antimicrobial. 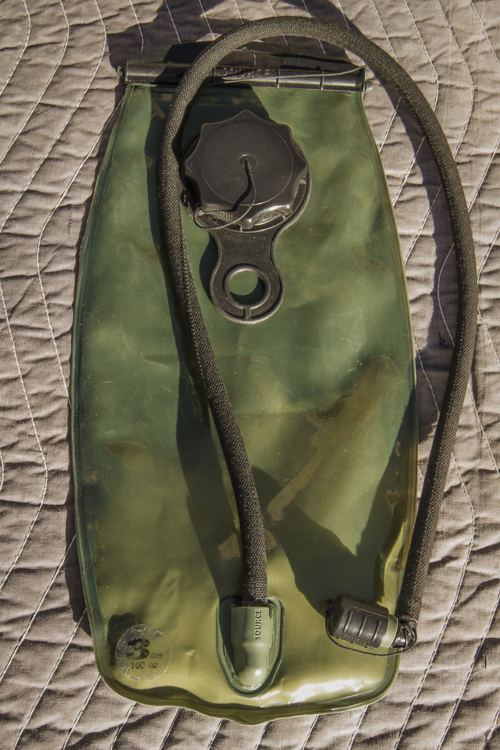 What I like about this hydration pack is its tough construction as it feels a lot tougher than a standard mountain bike unit. You can’t plan for inspiration, you have to be open to receive it at all times. 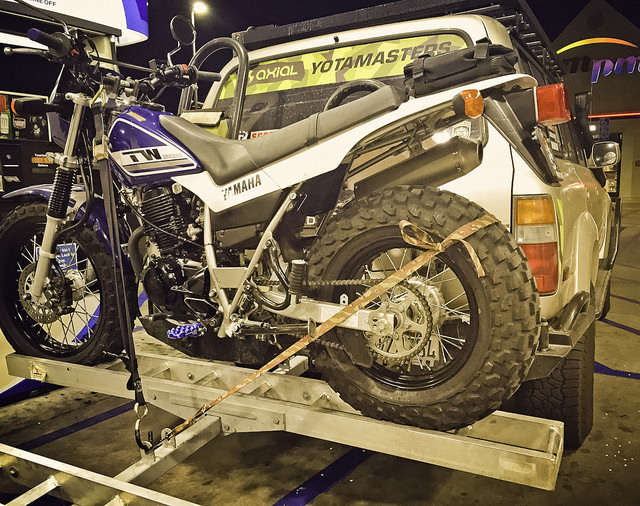 Back on September 24th, 2017 Jason Markley of Pedals Bike Shop and myself road our Yamaha TW200′s up to Big Bear, California for a day of dual sport trail riding. 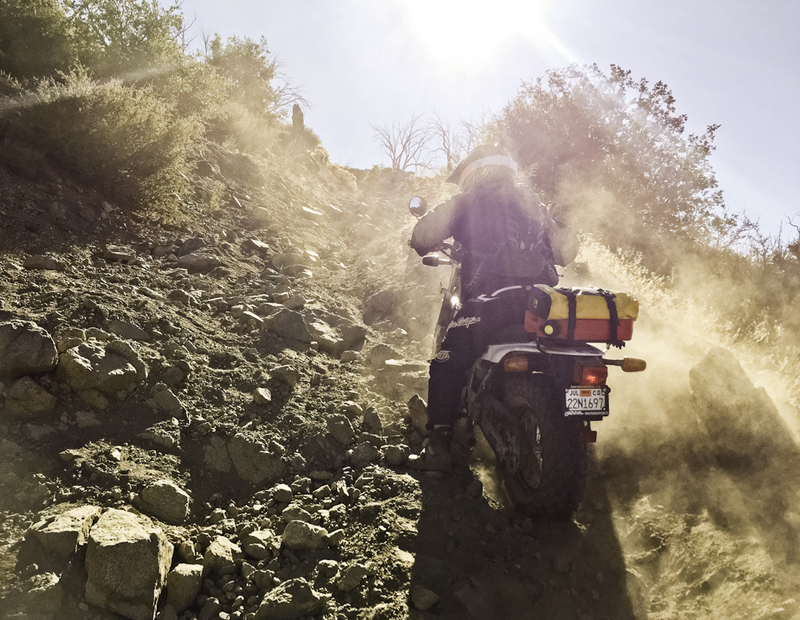 Nothing technical, just wanted to clock 100-miles in the dirt on our mini dual sports for the day. It was a great pleasurable day of putting in the dirt miles, nothing technical, nothing high speed (impossible on these bikes! hehehe), just consistent riding to get the miles in. 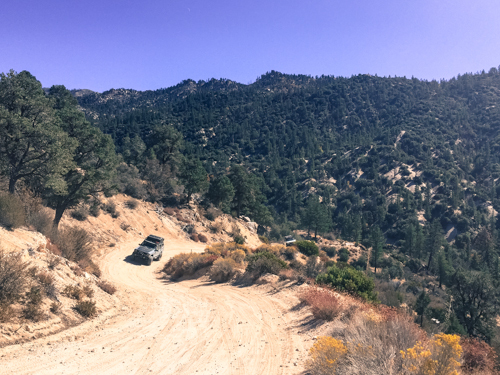 After lunch in the Fawnskin area of Big Bear, California we went out Coxey Road (one of many dirt roads in Big Bear) and just pass the Big Pine Flats Campground, Jason took us though a little fence opening with some trail markings. I paid no attention to the trail name we had just taken, but I should have known when I saw the two black diamonds on the sign though… In no time we hit this great wall of rock and dirt. The photographer in me had me jumping off to snap a photo of Jason before helping him! For the next portion of our day, everything we had done earlier in the day ( easy) was now juxtapositioned against this trail that was kicking our little bike’s butts! And ours! 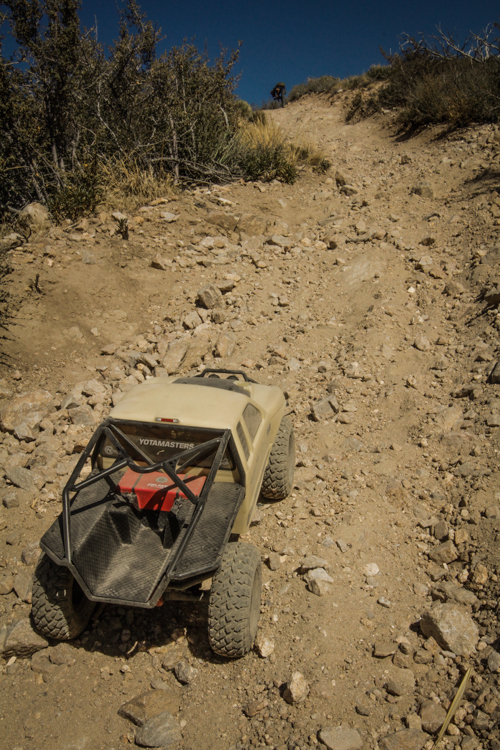 Small diameter tires (in height) with low foot controls, especially in comparison to our normal dirt bikes, is what made this trail most difficult! 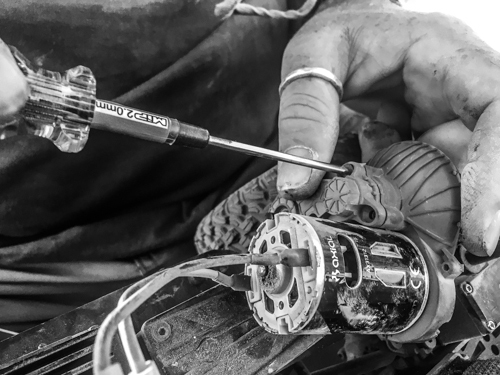 I bent the brake foot lever and gear shift lever respectfully around each foot peg due to banging into massive boulders that I was attempting to thread through and around. While the advantage of low seat height is a plus on these little bikes, the ground clearance is the negative, everything has it’s trade-off. To add to the situation, the sun was going down fast. 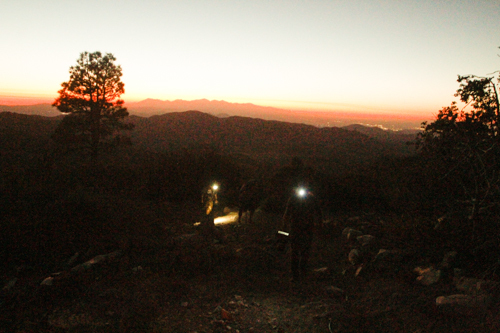 We didn’t know if we would be on-trail in the dark and we still would have a 30-mile commute back down the mountain. The high of the day was 59-degrees and the temperature is already dropping. 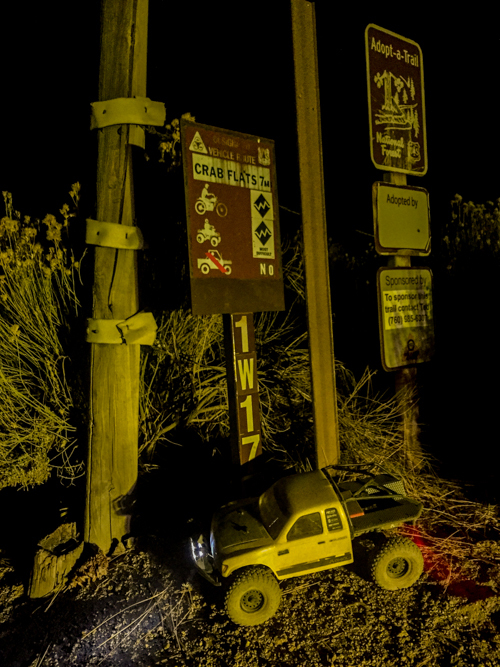 Upon reaching the end of the trail in Crab Flats, we came upon the trail’s end/start sign. 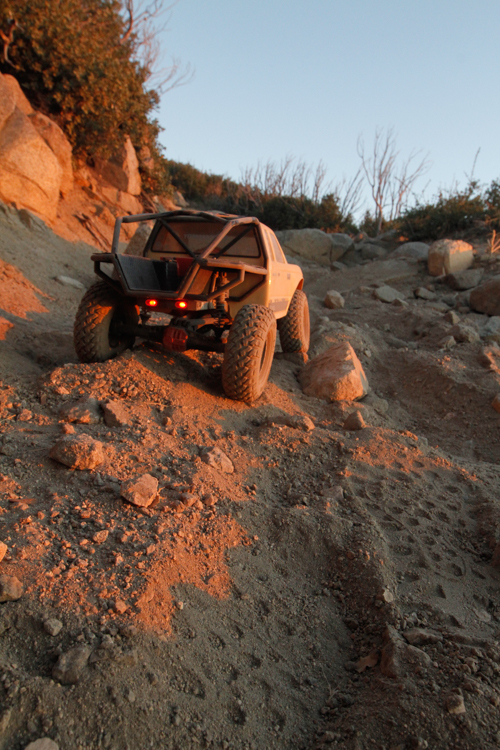 Upon getting home the thought of going back and SCX10 hiking that trail kept growing. 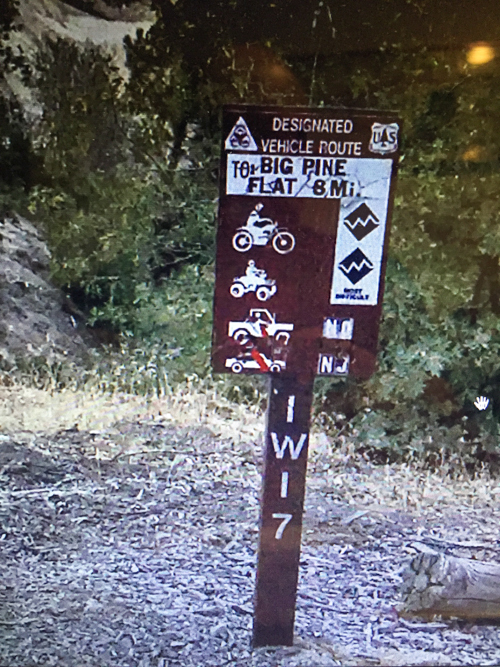 But just what is this “1W17″ trail? Why did it seem familiar to me? However, further search tells me this is the Malcolm Smith Trail! If you’ve watched “On Any Sunday” then you know Malcolm is a bit of a legend in the motorcycle world! But how did this become “his” signature trail? No real info readily available… Another story! 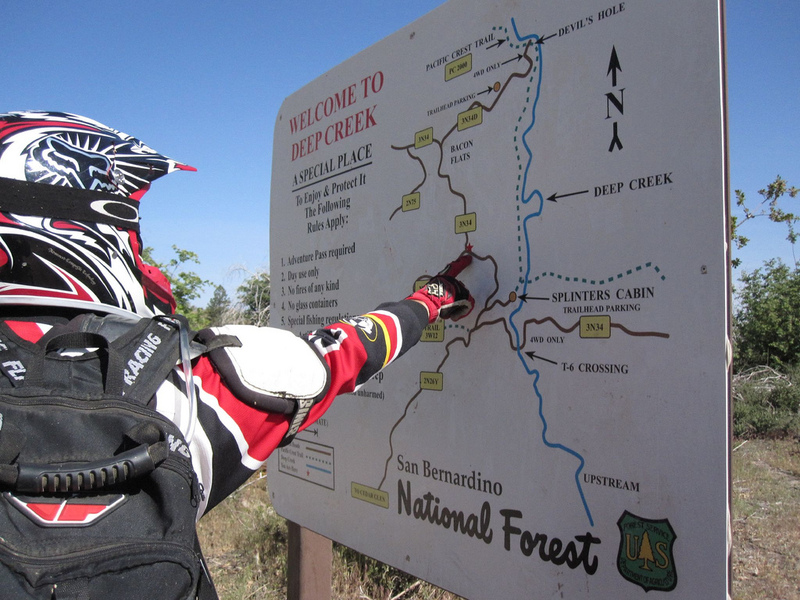 While on the trail at about the halfway point it all came to me that I have been on this trail a couple of times before back in 2009 as my buddy John Schultz and I rode it on bigger motos. 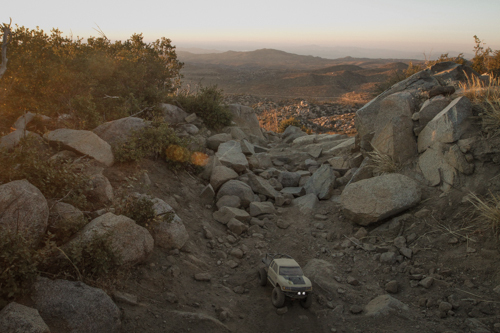 That day back in 2009 we ran the trail both ways and on our way back down we wanted to see how these 4X4′s were coming though here! 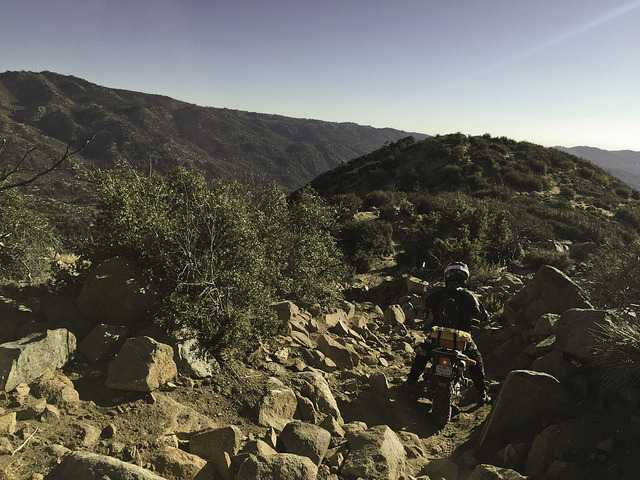 I also discovered there are different sections to the trail as the section we road today is the moto-only section or the 50″ or less vehicles… something like that. What I remember about that ride in 2009 was that is was quicker for us to get through here on our bikes in comparison to the Jeepers. 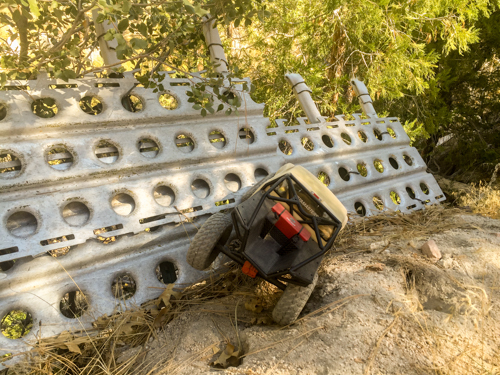 It’s one thing to thread two wheels through a rock garden and even a “footpeg scraping” boulder garden, but to put 4-wheels through these obstacles got our curiosity on one particular section. 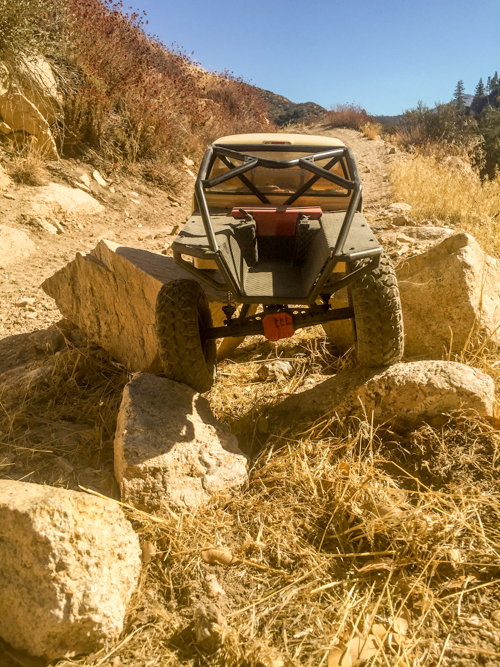 We stopped and waited to see how the Jeeps come through as we were able to thread through the rocks with our bikes, but the Jeeps will have to straddle, go over and work around some of the obstacles. 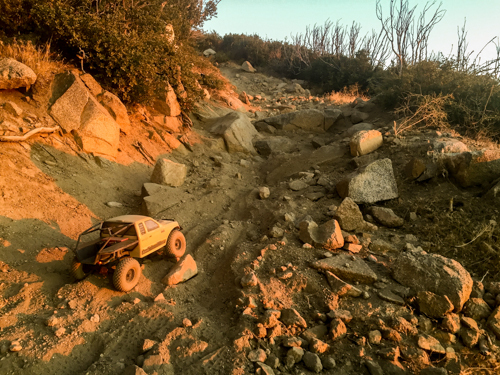 Remember all this, digging up these old photos, the “flood rush” of memories, my excitement level about the possibility of SCX10 hiking this trail grew even quicker! 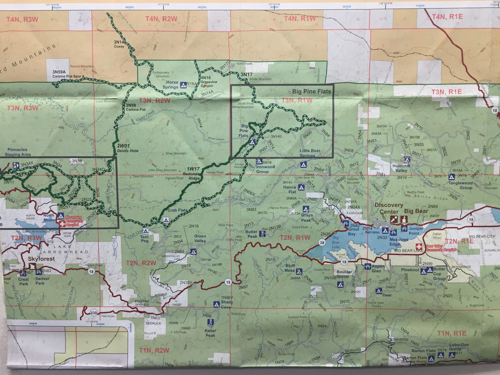 I started by getting the Big Bear map out and visualizing the dream. Then I start exploring the possibilities with some more visual planning. 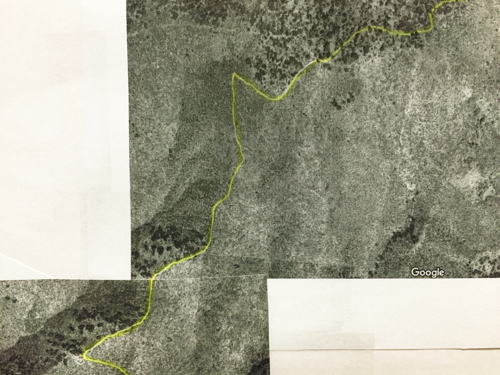 With Google maps I start selecting screen captures and printing them out for a larger view. 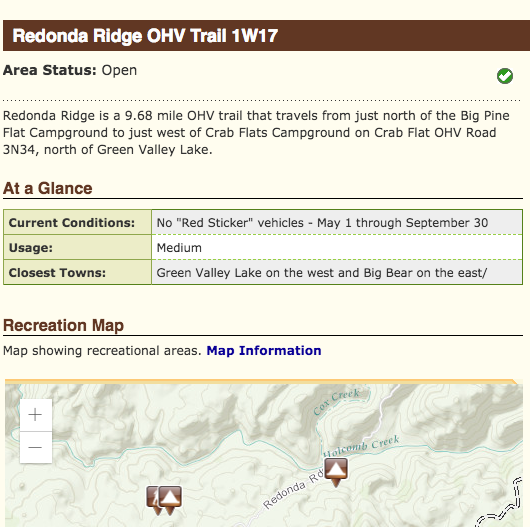 The trail is not indicated on Google Maps. I had to flip into satellite mode and find it visually. 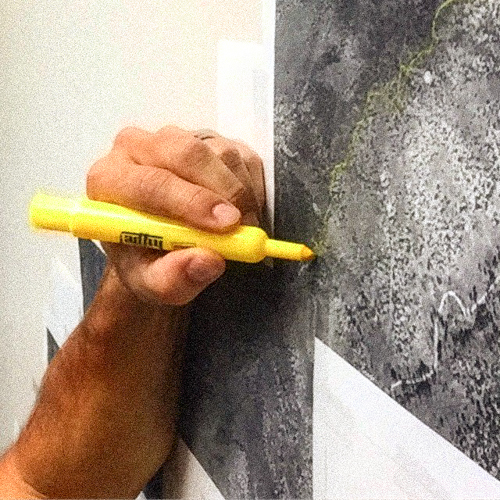 With a yellow highlighter, I start highlighting the path so I can see it from my desk. Now I have some nice inspiration on my wall! 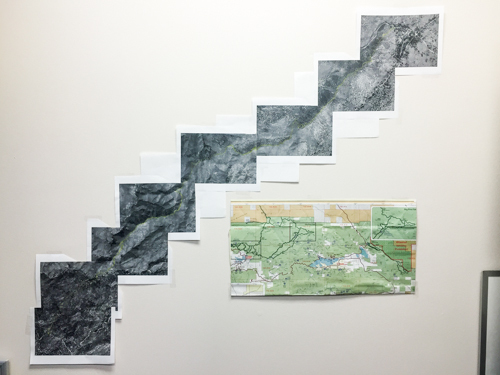 I walked into Scott Roberts (SR) office and asked him if he would like to hike with me over this trail as he has hiked a few trails with me previously. My idea was to have him document my efforts over this trail. SR agreed to roll, but said we should use this trip to shoot a video for an upcoming project. 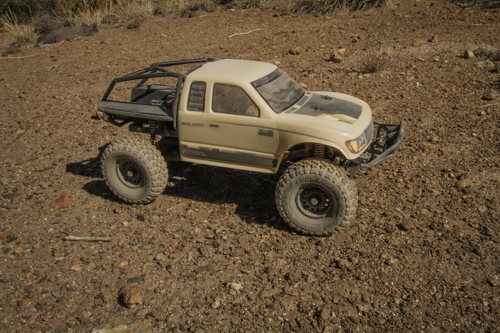 I was planning on using my GCR1 SCX10ii, but SR suggested a little something different. I like the idea and my simple plans instantly turned into bigger plans as timing of an upcoming project aligns, thus more personnel which leads to more planning. SR also said that Tony Phalen should come and shoot with the second video camera as SR would be shooting with camera 1. I’m usually the one shooting all the video for us, so this will make for an interesting change. 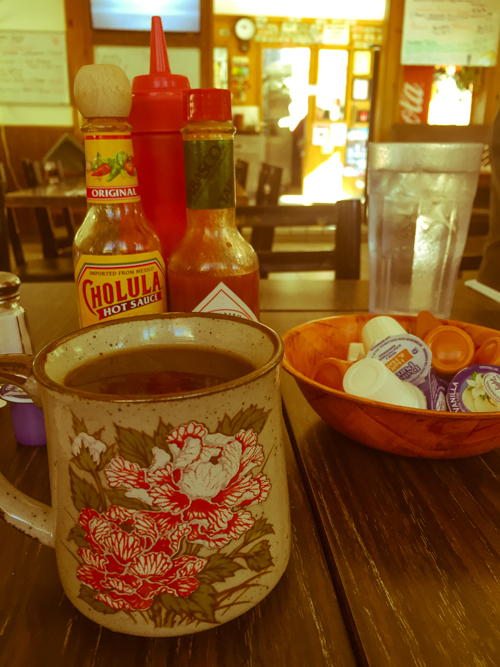 SR went on to state that we should invite Anthony Rivas as he “has a good eye,” lives close enough – maybe, and if he came, could capture the whole trip from his perspective for his social outlets. While I am a little concerned that I am loosing sight of my original goal, it is the end of the year and I rationalize the team effort as a team bonding effort. 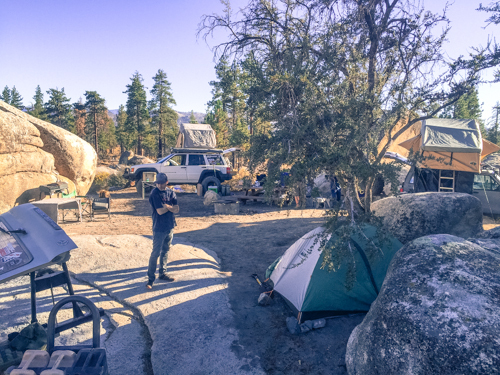 It has been a tough year, thus roughing it in the backcountry with the team is a perfect counter-balance to the mental stresses of work. I’m sure lots of you are laughing right about now, “oh the stresses of working at a big time R/C company!” “Really dude!” I say the same thing in talking with my bicycle-moto-auto industry colleagues! I try to be self conscious and always try to wear your shoes on my feet. I’m a size 10. OK, back on trail topic! Once it becomes more than just covering “the three primaries” for myself, adding the dynamics of the group becomes more critical! Food, water and shelter are “THE” three primaries in my book. 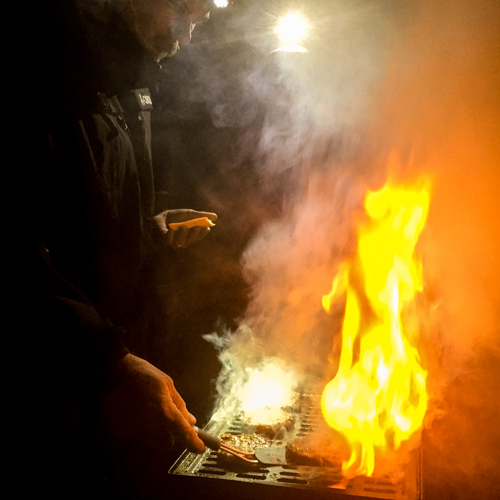 It’s one thing when we you only have to worry about food for yourself, but when you have to look after your team, especially in the remoteness of outdoors, it’s a little more serious. But it’s kinda’ old hat for me now as I’ve done this a few times. I have the formula (so do all moms); X # of guys (kids), X # Breakfasts, X # Lunches, X # Dinners, X # of days and I can quickly assemble what food supplies are needed. More names are added to the feed list and I will get into those details later. Time to choose which pack I will use as I have various ones collected over time. 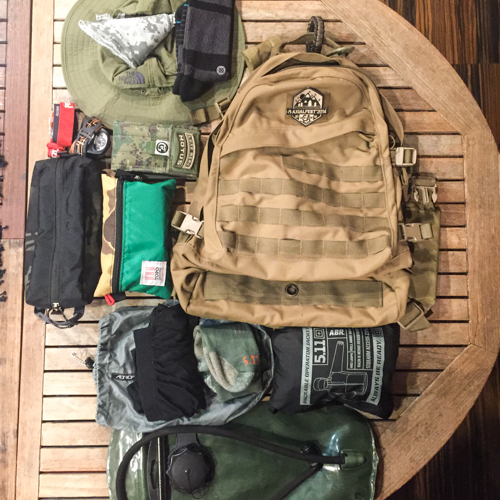 Between hiking, mountain biking, motorcycling, I have various bags for various jobs. 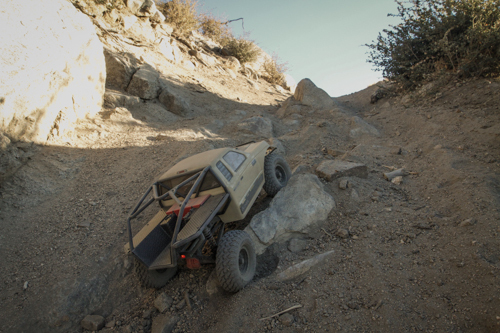 Aside from the personal gear, the R/C will need support as well. 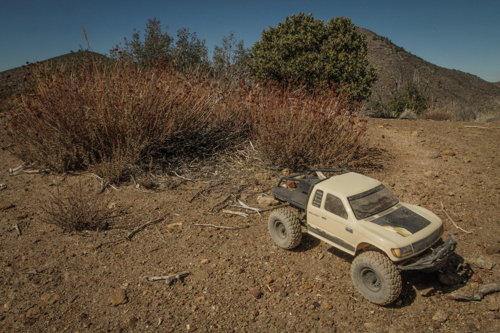 I’ve honestly have yet to assemble a “field tool kit” separate from my full R/C tool kit, just for RC hikes, until now. This is my minimalist R/C tool kit as it will only consist of 7mm nut driver, 1.5mm hex driver, 2.0mm hex driver and a pair of bent needle nose pliers. The beginnings of the assembly of necessities. Just choosing the pack is my hardest decision almost every time! It’s shouldn’t be.. It should just be, stack everything up and fit it into which pack it fits best, or better yet, just have one pack and that it, that all.. But I’m a bit of a “gear junkie” and “bag lust” is at the top of the pile! When I am multi-tasking my mission I have to think through every process. 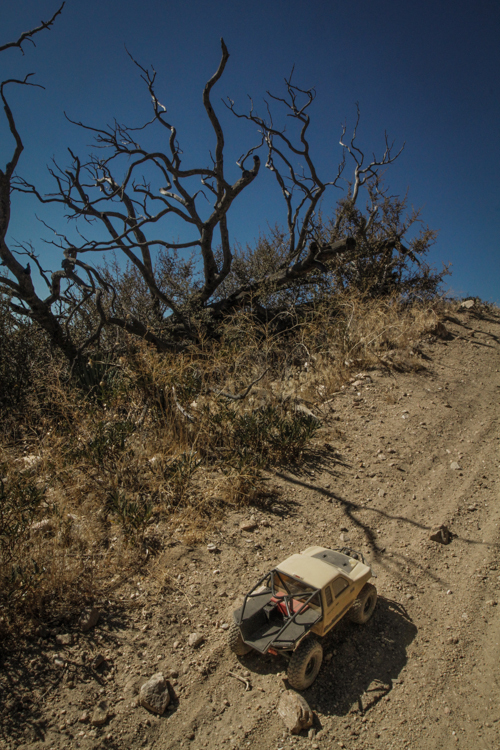 I’m not just hiking into a remote location, I have to carry batteries, tools and spares for the R/C rig. Plus, I will most likely be carrying camera gear. Even though I am not shooting the video for this trip, it’s my nature to document in photo the trip on a personal level, but at the same time, I have yet to find a specific camera pack that suits the other needs. I will get more into my load-out list details in another article. In the mean time, hydrate hydrate hydrate & stay the course. The Complete Walker IV is an in-depth guide to backpacking. It can be read as a book or as a guide, but I will get into that later, more importantly, this is the book that I tell people that it saved my life! Back in 2007, I broke my neck in an off-road motorcycle accident and for a period of time (4-6 months) I did not know what my physical condition outcome would be. LUCKILY, I knew I would be walking, but what I didn’t know is what type of activities I would be able to pursed afterwards. 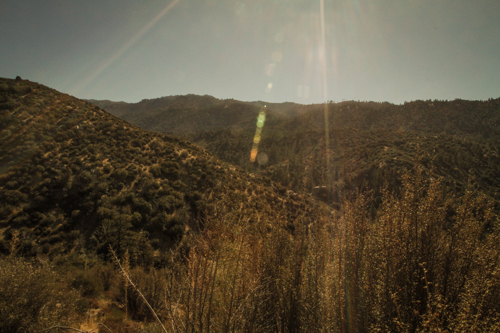 Instead of dwelling on the unknown, I needed something positive to looks towards to, so hiking it was going to be. I needed something to soak myself mentally into (positively) and began reading every possible thing I could find on hiking! In my quest to find the backpacking authority, I discovered this book. For me personally, this book is great in that it can be use this book multiple ways; like a traditional book from cover to cover or as a resource guide using the index as it organizes topics specifically and you can reference where in the book that topic is discussed. I like Colin’s writing style as he tells you more than just the material makeup of a product, he will give you his personal opinion of the product, good, bad, or salty. He also gives in great detail how he is using it within nature and he typically engages you in a way that has you wanting to be with him in that moment or location. While I have not read this book in a while, I still use it be it a specific technical reference, or for some quick inspiration as it sits at by bedside table. I can now simply pick it up and open it to whatever page and just start reading it is a very entertaining read. 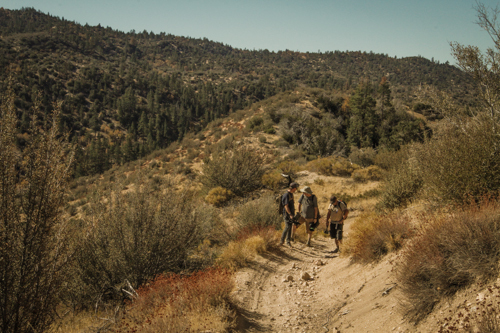 With the years of experience from both Fletcher and Rawlins, this book is largely credited with launching the modern-day backpacking movement. Since its first publishing in 1968, this book has been one of the most used sources for hiking and back country information, so classic in fact that Field & Stream magazine called it “the Hiker’s Bible.” But when Fletcher talks about “carrying your house on your back” his writing captivates you beyond just the nuts and bolts “how-to’s” of backpacking. Mr. Fletcher wrote. 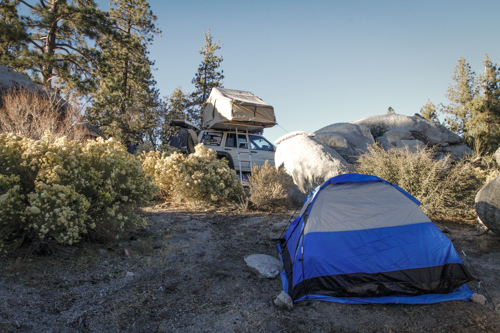 Although “the best roof for your bedroom is the sky,” a light tarp is better than a tent. Among his other suggestions: trim the handle of your aluminum pot and even that of your toothbrush thus making impressions upon anyone captivated by the outdoor life. 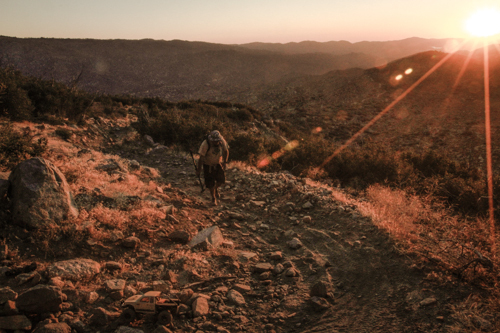 “Colin was sort of the founding father of modern backpacking, the first person to write about going out for an extended period and being self-sufficient,” said Annette McGivney, the Southwest editor of Backpacker Magazine. When I was laid up with a broke neck (literally) this was the type of inspiration that I needed! Even now, fully healed, this is what I seek out! Colin Fletcher, (now deceased) was almost 80 years old when this 4th edition of his classic book was published in 2002. 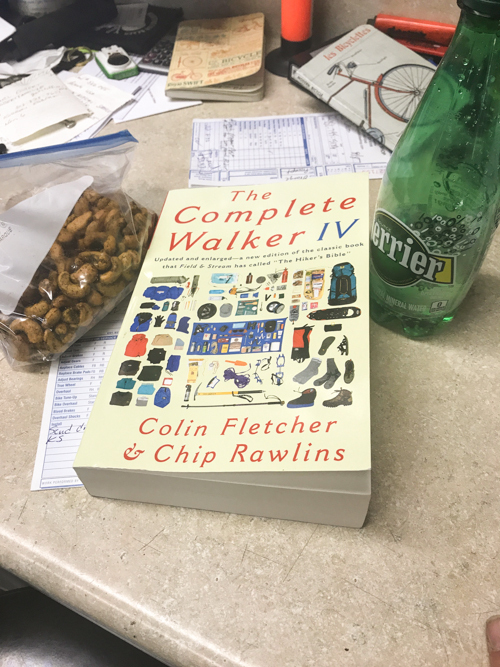 The IV edition is updated and enlarged, mostly due to the efforts and contributions of Fletcher’s co-author, Chip Rawlins. From Chip, I learned more about minimalist backpacking and the art of just getting out to any spot, even if it is to just sit by a tree on a hillside vs having to do the “big adventure.” While Colin inspired me, Chip made me see the reality and to not “over big” it and just go get out there. 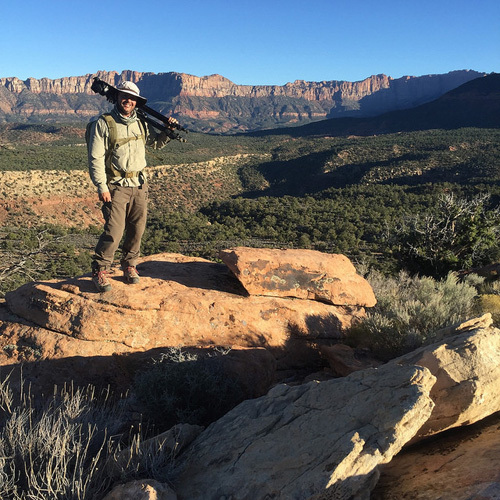 First, the contents of this book reflect the years of experience in “walking” — what we now call backpacking — by the man who years ago walked the length of the Grand Canyon and then wrote about it in a series of books, launching the modern-day backpacking movement. Fletcher describes in detail everything from how to pack your backpack for crossing a river, to what snacks are best to take with you, to measuring humidity, to calculating the right mix of food for the energy output you need, to real-life example of the dangers of dehydration. 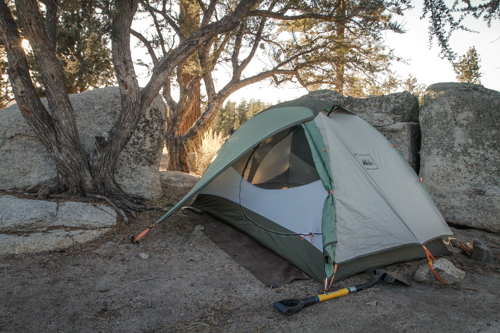 Second, Fletcher’s sometimes brutal reviews of the latest backpacking equipment don’t just give a simple Yes or No review, but actually go deep in discussions about the science of the fabrics and technologies used. Sometimes, where the two authors disagree, you’ll find each of their opinions labeled with their names, and the back and forth dialogue is simply fascinating and very educational. 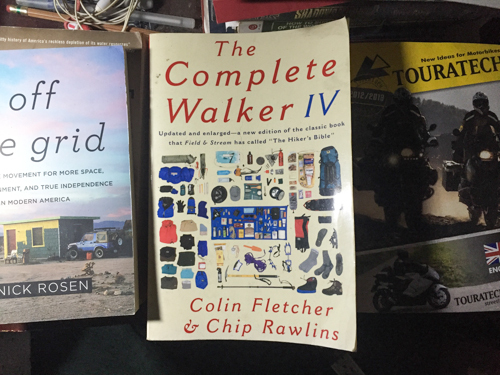 Third, we know of no other book on the subject of backpacking that is so in-depth and also so full of practical advice and examples from real-life treks as The Complete Walker IV. We guarantee that you’ll find this book loaded with very helpful information if you can set aside some time to read it. At over 800 pages, you won’t finish it in a day or two, but you’ll find yourself coming back to it again and again, and it’s great for reading several months ahead of a major backpacking trip. 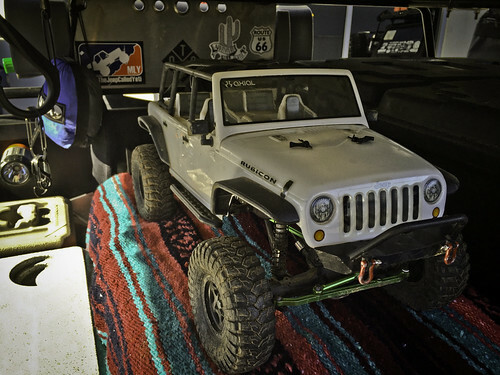 Back in 2013, we published a series of blog posts that I wrote documenting our efforts to take a bone-stock 1/10th scale Axial AX90028 SCX10™ 2012 Jeep® Wrangler Unlimited Rubicon 1/10th Scale Electric 4WD – RTR out of the box and drive it over the world renowned full-size Rubicon Trail. 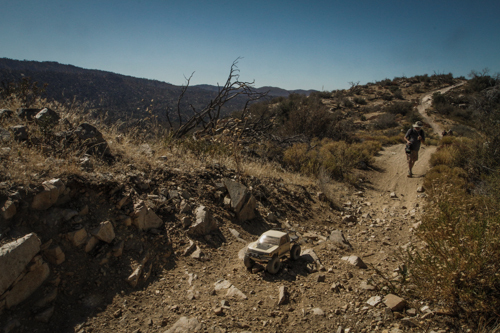 Our Rubicon Trek took place in October of 2012, and those blog posts reflect each day’s events from start to finish. What those blog posts did not show is the video footage documenting this trip – until now! We have two video’s; one at 9-minutes long talking about the trip over video footage and the second one at 55-minutes that shows a lot more footage for your milk & cookies viewing pleasure. The photos from that trip was purely secondary to the docu-trip as they were shot with a little Canon PowerShot SD1100 IS pocket camera carried in my pocket. 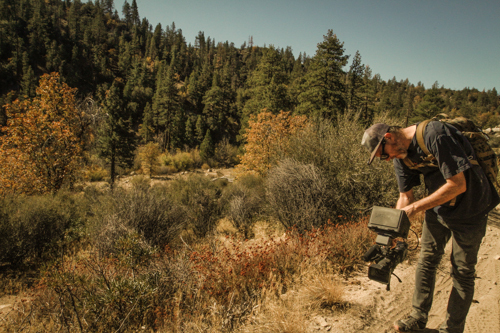 The video camera and heavy duty tripod was the “heavy equipment” weighing in at 19-lbs. 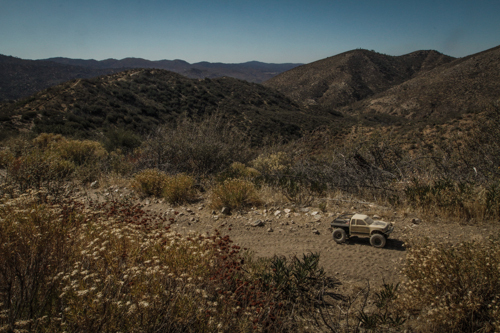 I did not shoot every square inch of the 15+ mile trail, so there was a lot of shoulder time with the camera as getting in-and-out of the Jeep was not practical as we had all the camp gear and equipment spread out in the Jeep once we were on trail. 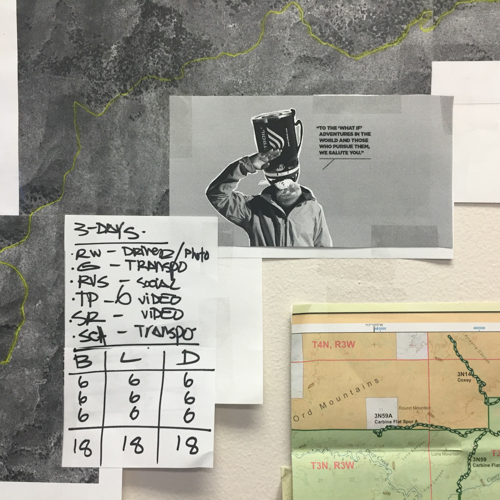 Regardless of the rigors I personally went through, I am very stoked to have the opportunity to plan, execute and document this trip. 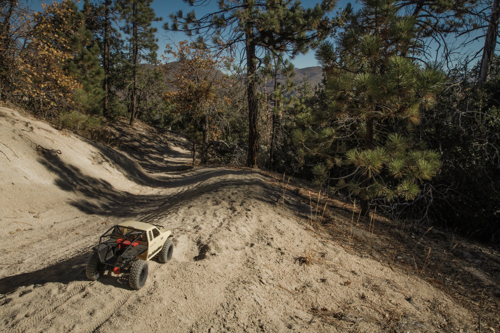 These videos reflect the Axial SCX10’s pure performance capabilities. Need a jump-link to those previous blog post? 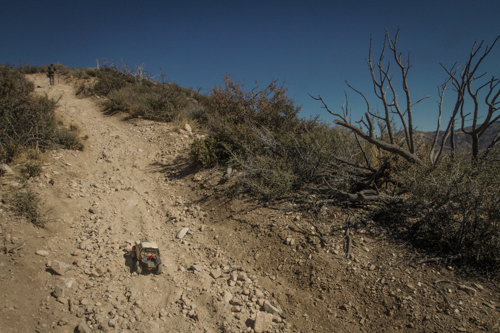 No mater what you call it, you know you forgot to drink water and bring snacks on that last RC adventure hike! Nothing wrong with that, but these three basics are the things that matter most in life! Food – Water – Shelter. Water, food and shelter are provided to us from day one, until we learn how to provide for ourselves. These are the simple truths of life. But back to our pursuit of play. 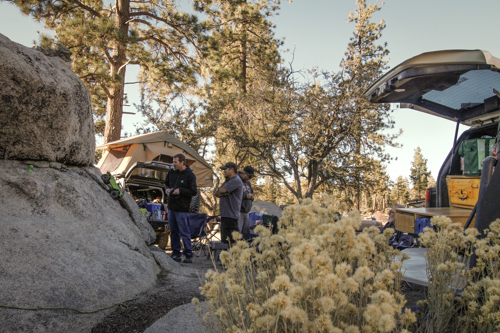 No matter if you are hiking, camping, off-roading or mountain biking, food-water-shelter are the three raw basic essentials across the board. 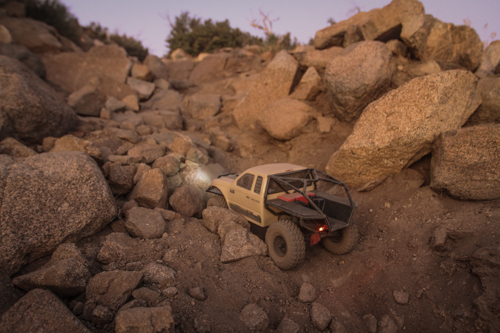 The root of the Axial brand is the SCX10, THE adventure rig! 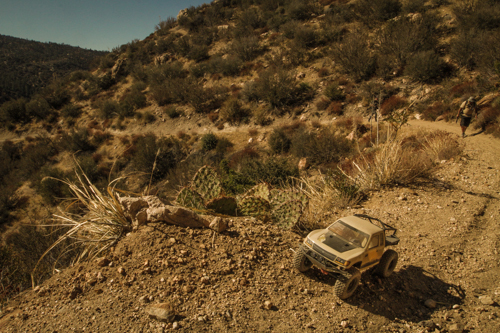 Thus hiking with your SCX10 can take you into a world of adventure beyond the backyard boundaries. 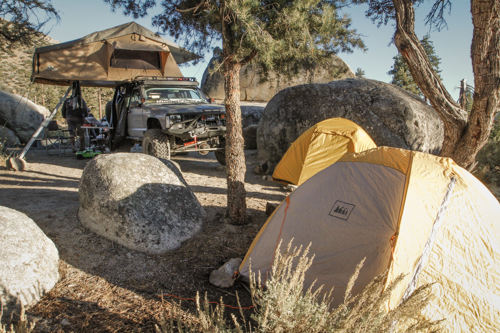 Your rig is adventure ready right out of the box as seen in our 2012 trek Across Rubicon, but are you? You know I love adventures of all sorts and some of you may know I’ve been very passionate about bicycling as well. While I like all the hard parts techno-babble lust, it’s the physical engine on the bike that makes a grandpa on his ’80′s 20-lbs steel frame bike smoke a dude on his 14-lbs all carbon bike! It’s been my interest in cycling that has built my passion for attempting to be more physically fit so I can take on all these adventures. But simply walking into a bike shop and asking questions on physical performance will NOT get you what you want, rather what they want to sell you. What you need is information first and I have spent a many nights doing my research and Hammer Nutrition has given me some serious education over all the other brands. Lets start at the beginning. The single most important element, water. 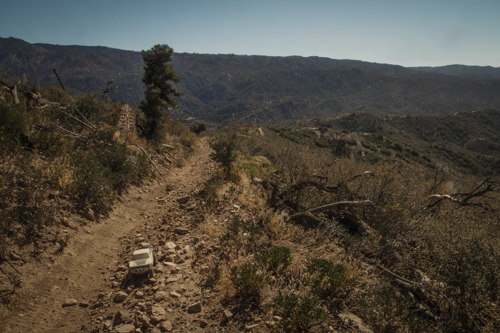 Yea, sure… we’ve all gone without it for a few hours on a hike or ride, but how did you feel afterwards? How did you feel the next day? Often times, doing the right thing now for your body doesn’t give you instant results, but the effects of properly hydrating means you will be better suited for tomorrow. And as I age, I only find it more important! Here you thought it was just your job on Monday that made you feel like crap… OK, maybe the margarita too. Back to education. I like the fact that Hammer Nutrition will tell you that you do not have to buy their products, others will work, but they are winning my dollars with their education! reason! Here is some more great education from Hammer Nutrition. 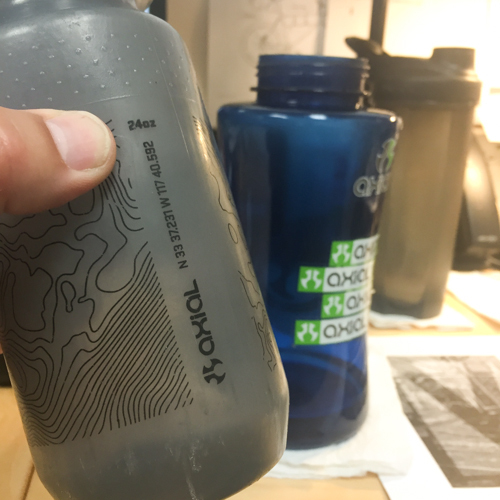 Hydration – What You Need to Know & How your cooling system works hit that link and make sure you read down to the “ELECTROLYTE REPLENISHMENT – Why it’s so important and how to do it right” link too. That’s a lot of information just about water! As you can see, HYDRATION is the first on their Essential Knowledge list and Hammer Nutrition does NOT sell you any sort of super advanced coal mined calcine denatured bio-lab fortified pasteurized WATER! 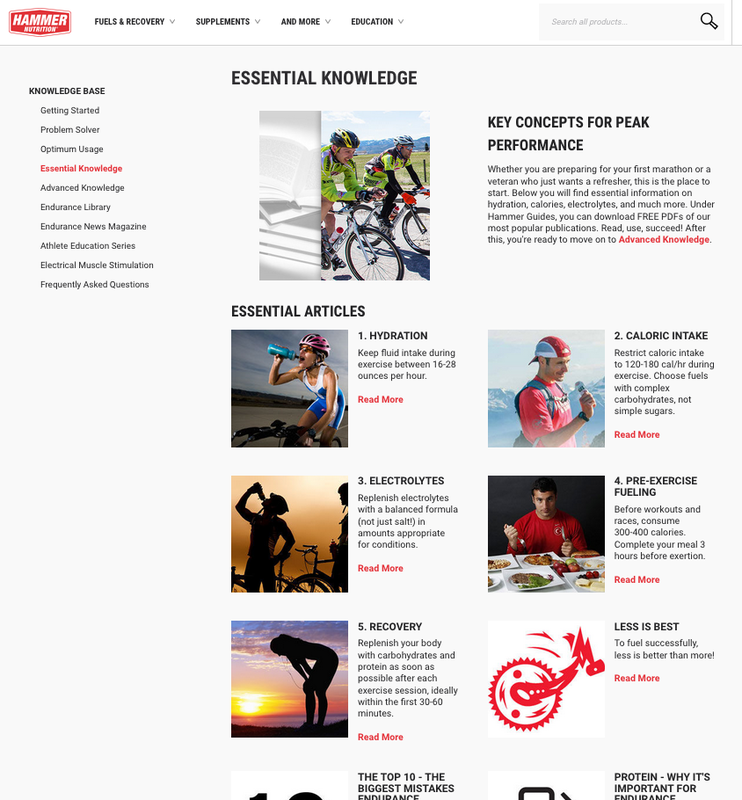 Now, while a lot of Hammer’s info is geared towards endurance athletes (all you ULTRA 5K ENDURO guys should be reading every ounce), everything is a sliding scale that you will tailor to your physical needs. My rule of thumb, if this is what gets you to peak performance levels, I can scale down to my personal needs. We all start at zero with the outer limit being the unknown. Getting a grasp on the outer limit now gives us a “window” or sliding scale to work from to suit or test our needs. You can’t go from zero to “FULL PUNCH” in 2.2-seconds and not expect consequences. You have to build up.It’s baby-steps, building blocks built on time, thus patience is involved in building endurance to tap out miles on a bike or a hike. You may have heard me refer to my Scooby Snacks and ScottG calls it my “cardboard bars” but when we are on our go-missions, I like to travel light and physically fuel as simple and efficiently as I can. Again, through cycling I’ve learned about proper nutrition for physical activities. Yes, I started with the original, the PowerBar somewhere around 1988 when I moved down to southern California and started mountain biking. I’ve tried them all! I technically don’t have a hands down favorite… it’s like saying I only eat hamburgers. I like variety and switch around with both brands and flavors. 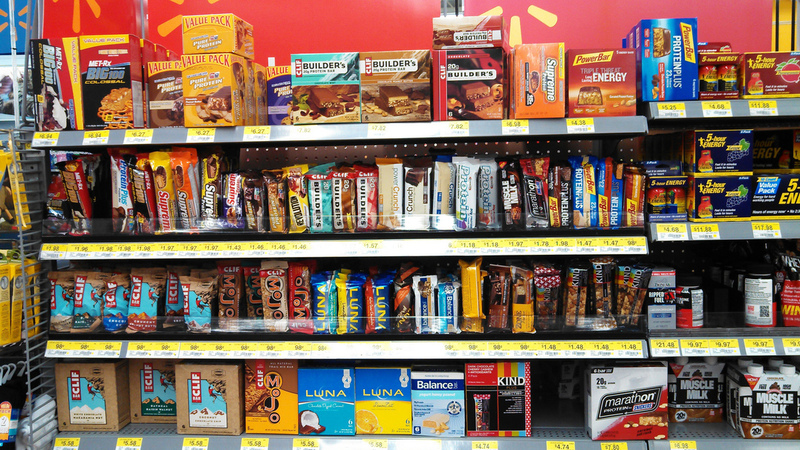 But the most important part of all is getting good calories into your system vs “sugar-crash” calories from candy bars. 1. Appropriate footwear. 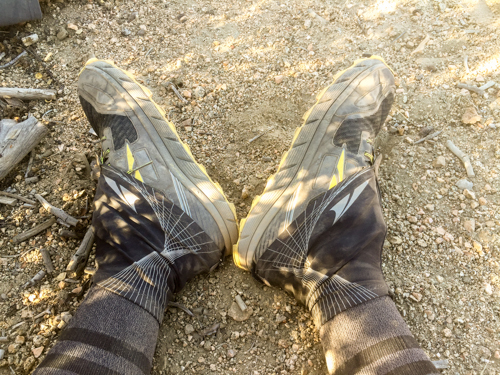 For a short day hike that doesn’t involve a heavy pack or technical terrain, trail shoes are great. 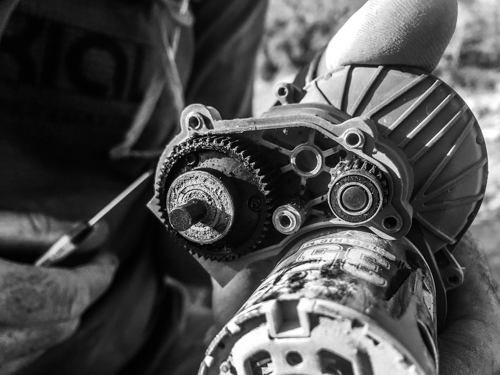 For longer hikes, carrying heavier loads, or more technical terrain, hiking boots offer more support. 2. Map and compass/GPS. 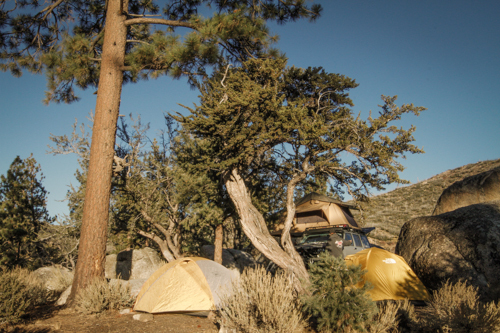 A map and compass not only tell you where you are and how far you have to go, it can help you find campsites, water, and an emergency exit route in case of an accident. 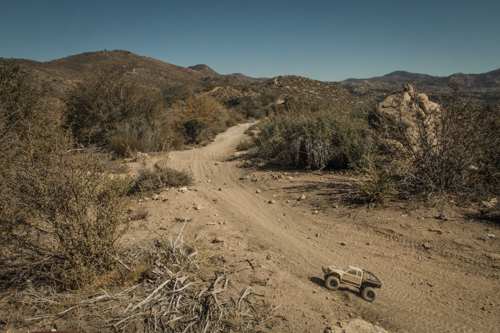 While GPS units are very useful, always carry a map and compass as a backup. 4. Extra food. Any number of things could keep you out longer than expected: getting lost, enjoying time by a stream, an injury, or difficult terrain. Extra food will help keep up energy and morale. 6. Safety items: fire, light, and a whistle. The warmth of a fire and a hot drink can help prevent hypothermia. 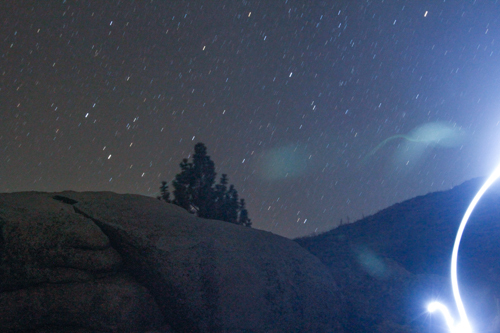 Fires are also a great way to signal for help if you get lost. If lost, you’ll also want the whistle as it is more effective than using your voice to call for help (use 3 short bursts). 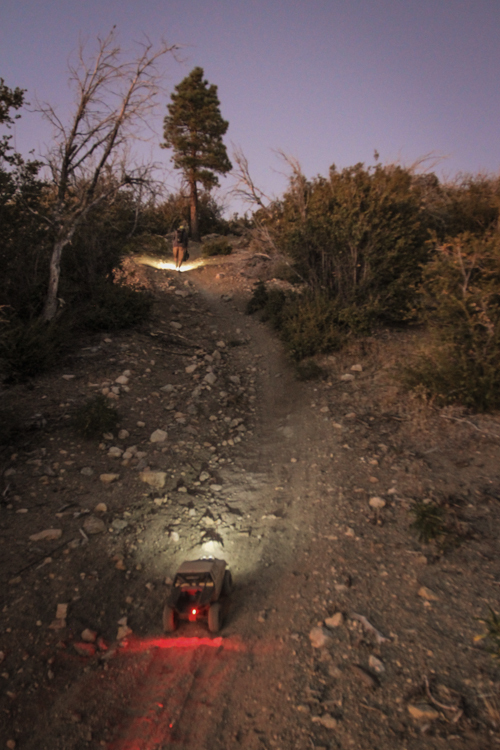 And just in case you’re out later than planned, a flashlight/headlamp is a must-­have item to see your map and where you’re walking. 7. First aid kit. 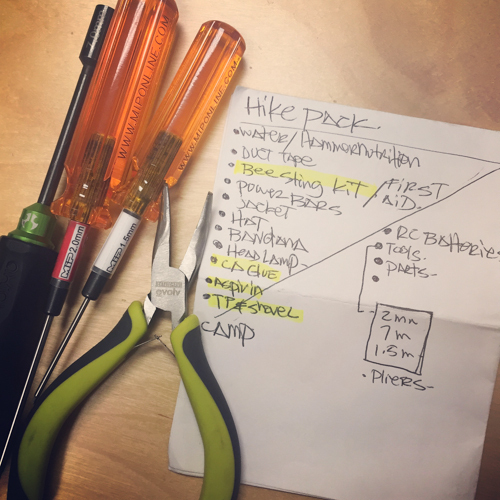 Prepackaged first­aid kits for hikers are available at any outfitter. Double your effectiveness with knowledge: take a first­aid class with the American Red Cross or a Wilderness First Aid class. 8. Knife or multi­purpose tool. 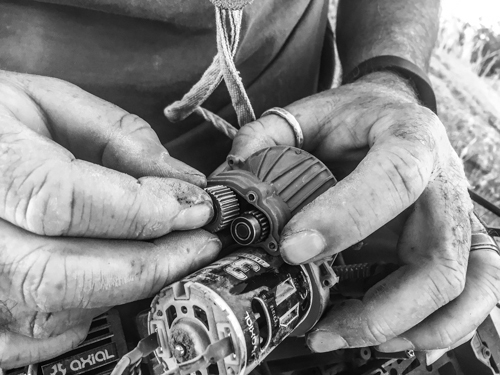 These enable you to cut strips of cloth into bandages, remove splinters, fix broken eyeglasses, and perform a whole host of repairs on malfunctioning gear. 9. Sun screen and sun glasses. 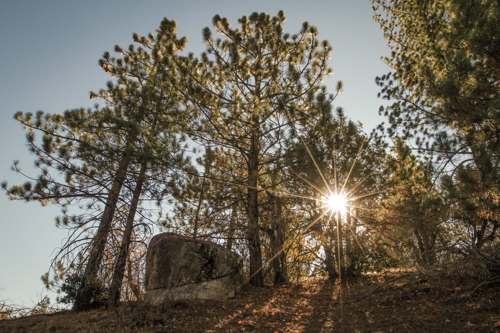 Especially above treeline when there is a skin­scorching combination of sun and snow, you’ll need sunglasses to prevent snow blindness and sunscreen to prevent sunburn. 10. Daypack/backpack. 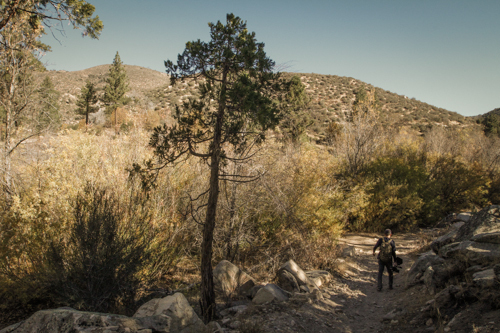 You’ll want something you can carry comfortably and has the features designed to keep you hiking smartly. 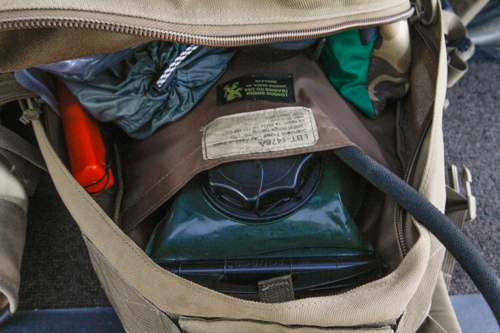 Don’t forget the rain cover; some packs come with one built­in. 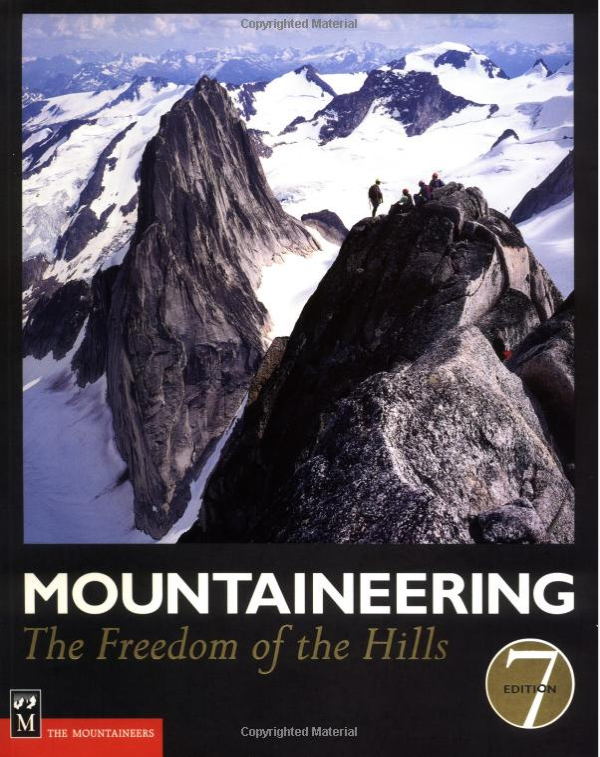 In 2003, the essential list was revised as part of the 7th-edition of “M​ountaineering: “The Freedom of the Hills”​ to keep up with modern equipment. The 8th-edition​ continues with the new essentials list with no major revisions. The list takes a “systems approach” giving more definition to each subject or function. Hydration: ​Add extra 2 liters of water for one additional day (for emergency). Nutrition: Add extra food for one additional day (for emergency). Dry food is preferred to save weight and usually needs water. Navigation: Topographic map and assorted maps in waterproof container plus a magnetic compass, optional altimeter or GPS receiver. Sun protection: Sunglasses, sunscreen for lips and skin, hat, clothing for sun protection. 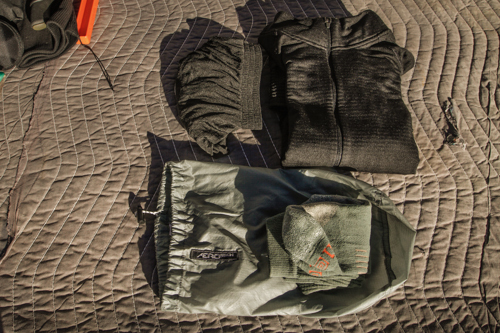 Insulation:​ Hat, gloves, jacket, extra clothing for coldest possible weather during current season. 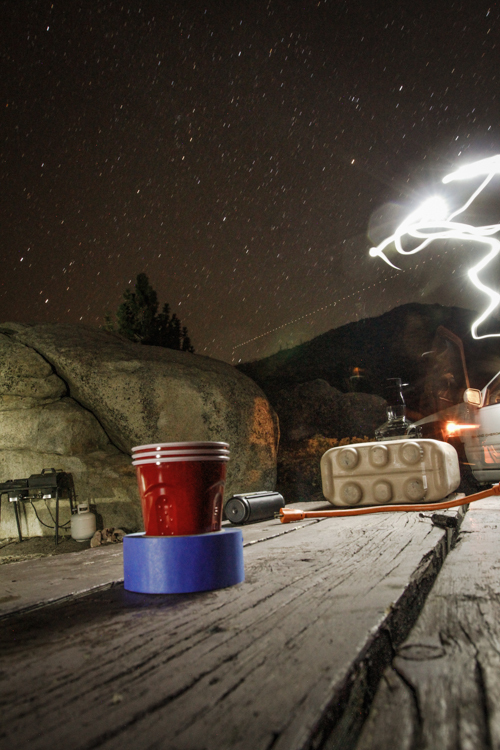 Illumination: Headlamp, flashlight, batteries. LED bulb is preferred to extend battery life. First­ Aid: supplies,​ plus insect repellent. 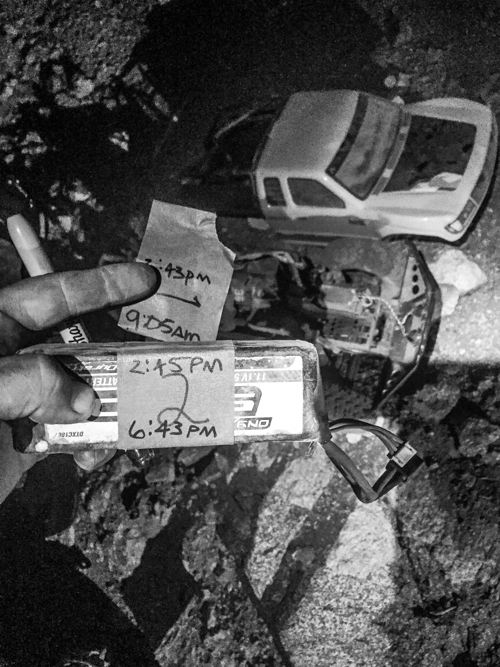 Fire: ​Butane lighter, matches in waterproof container. 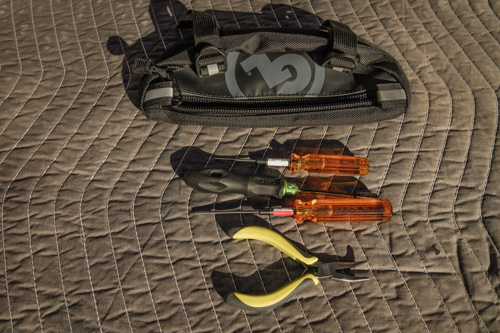 Repair kit and tools: Knives, m​ulti-­tool,​ scissors, pliers, screwdriver, trowel/shovel, duct tape, cable ties. OK, so there you have it, the first installment of the GCRad1′s Basic 101! 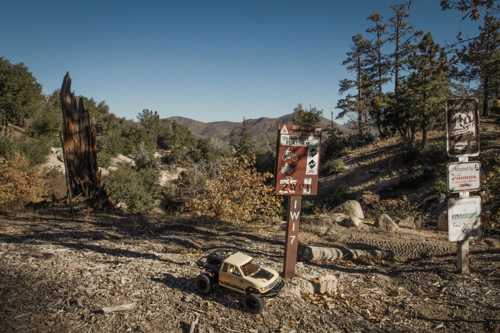 Stay young, play hard and get your RC Adventure Hike on! 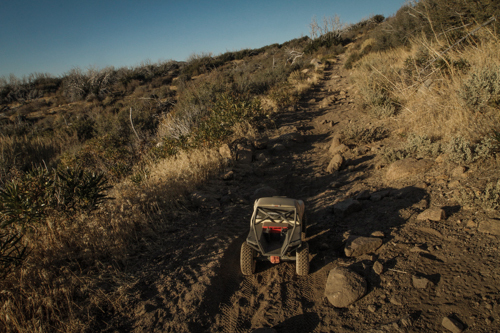 Always in search of adventure one rock at a time! – Rodney Wills. 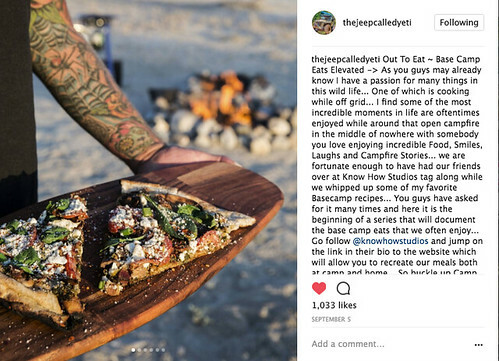 Before we get into making pizza on a campfires, let me briefly give you a little bit on how I got to know Yeti & Yolo of Yeti Built, a couple of full-time adventurers! Back in December of 2016 I met Yeti & Yolo for the first time during the Goose Gear Open House in Huntington Beach. 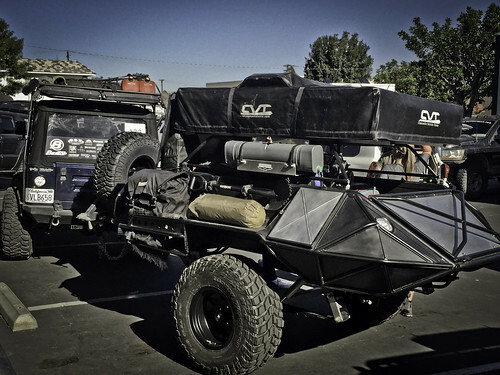 As I was cruising around checking out all the overland rigs, this one rig with a very distinct trailer caught my eye! It’s a super unique trailer with very interesting design! 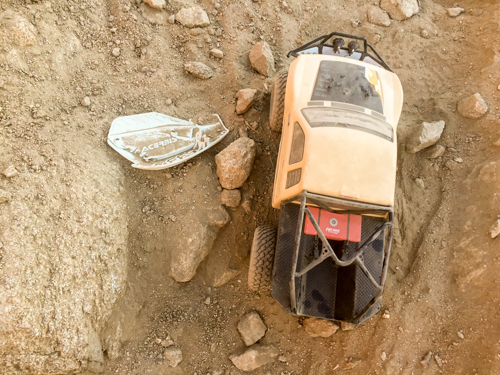 Upon closer inspection of the trailer I noticed Yeti’s Axial SCX10 and I started my barrage of questions! That is a 8,000-word untold blog into itself! 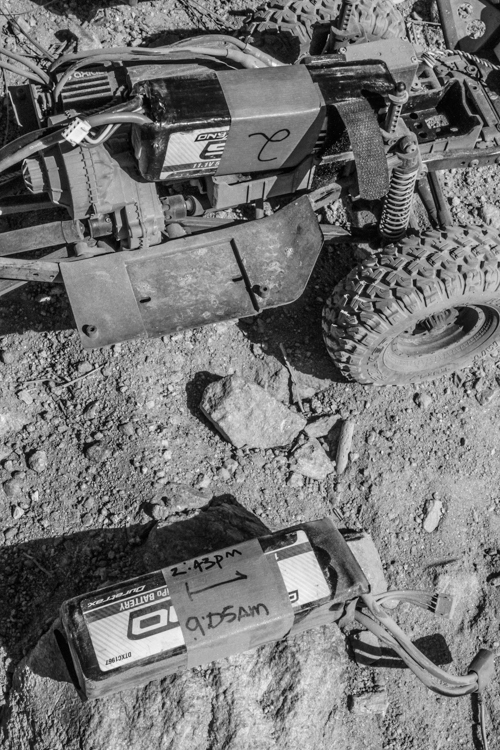 But our paths would not cross again until the 2017 King of the Hammers as Yeti and Yolo were in attendance for the whole week and their booth-camp was right behind ours! We got to spend time with them and really hit it off and needless to say I’ve been cyber-following them ever since! 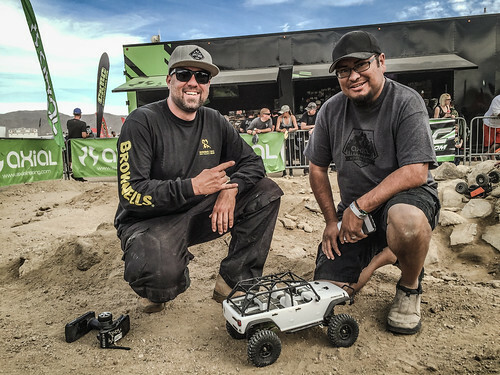 Anthony Rivas (right) did some preventative maintenance to Yeti’s (left) SCX10 as they hit the road for the summer (and for life), yet while at KOH, Yeti ran his SCX10 in the nightly rock races and also in the Ultra 5K Enduro on the Saturday following KOH. 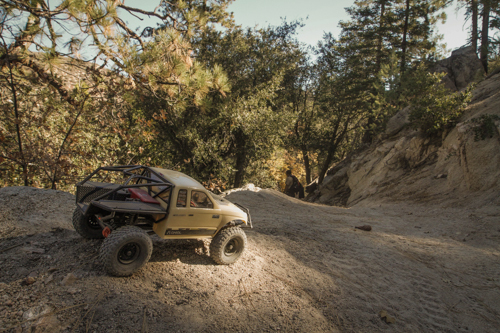 The Sunday after KOH we would all pack up and invited Yeti & Yolo to run Rattlesnake Canyon with us! 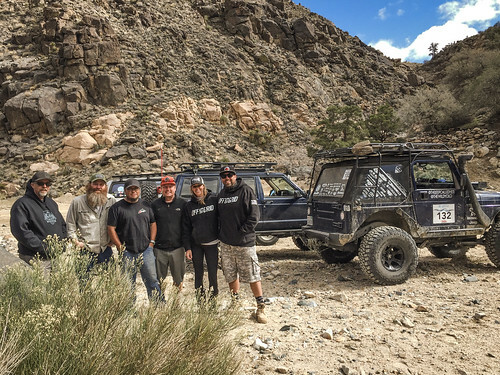 L2R: John Schultz, Shawn Barton, Anthony Rivas, Jason Markley, The Wild Yolo & The Jeep Called Yeti. Yes, that’s their names and we are sticking to it! NOW ON WITH THE FOOD!!! Recently the Yeti & Yolo duo did a post in conjunction with Know How Studios on Mesquite Pizza. 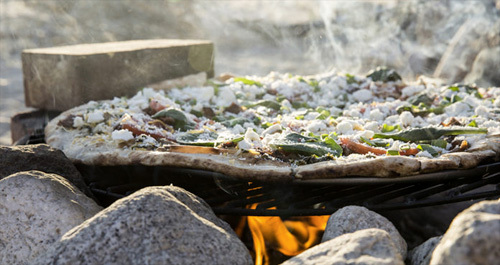 Yeti loves to cook and since he truly is a full-time adventurer, why not wood fired pizza! His IG post put me on the chase; swipe-swipe-swipe of the photos and chasing down the link to the thread over on the Know How Studio page! 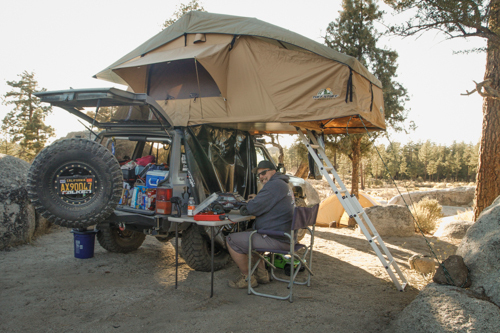 Here is how Yeti does it so you and I can do it too, in our backyards, pretending to be on full time safari!